Skoda has been sticking Scout badges on rougher, tougher 4x4 versions of its cars for more than a decade. The first was the Octavia Scout, and since then this badge has been applied to everything from a Roomster to the Fabia Estate. 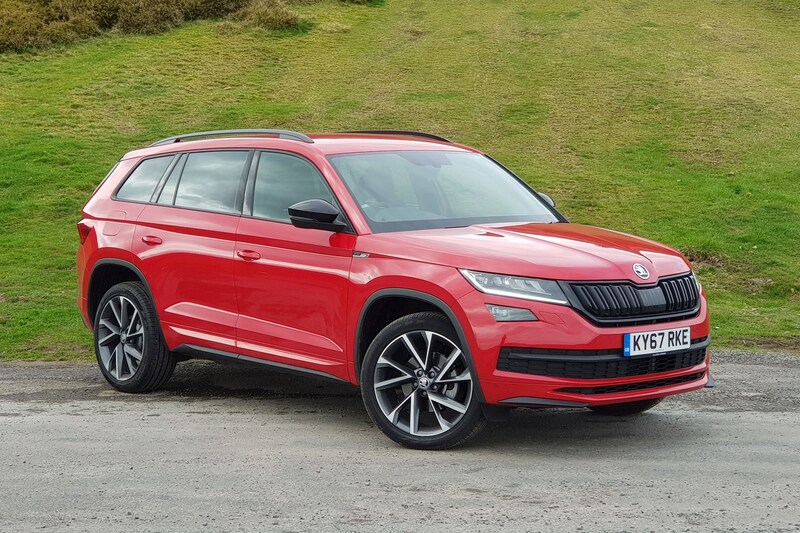 It follows then that this Kodiaq Scout is a similar offering – an all-wheel drive only, off-roader version of Skoda’s smart-looking seven-seat SUV. Hang on a minute, isn’t the Kodiaq already an off-roader? Well yes, sort of. It’s shaped like one and that gives it an air of wilderness capability, but you’ll pay extra for all-wheel drive, which is a bit of a contradiction. That’s where the Scout comes in – it has 4x4 as standard and a host of tech including an off-road drive mode that adjusts the chassis, engine and brakes, plus there’s Hill Descent Assist and some tough underbody protection. How much extra does this cost? Our car (a 2.0-litre TDI 4x4 with 190hp and DSG automatic gearbox) is £2,295 more expensive than an equivalent SE L, weighing in at £36,765 as opposed to £34,470. On a four-year PCP deal you’ll pay £414 per month for the Scout and £378 for the SE L (both with a £5,000 deposit and 10,000-mile-per-year allowance)* so our car is costlier to finance, although only to the tune of a smartphone contract. We’ve also added some options (adaptive suspension and heated everything, essentially) taking it within a hamster’s breath of £40,000. Wouldn’t you just get a Land Rover? 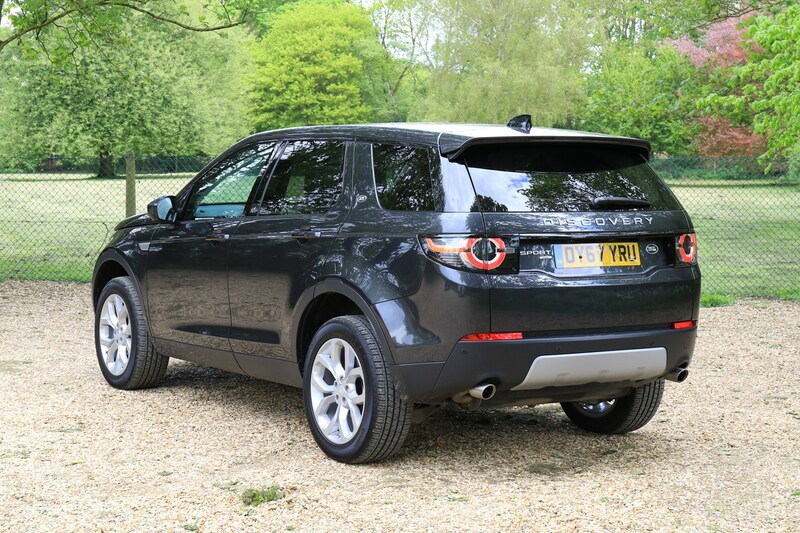 A broadly similar 2.0-litre diesel Discovery Sport costs £34,710, which is less than our car, but it’s £440 per month on an identical finance deal. You’d imagine the Disco Sport would be better off road, but it’s also smaller in the back and less well equipped for that money. 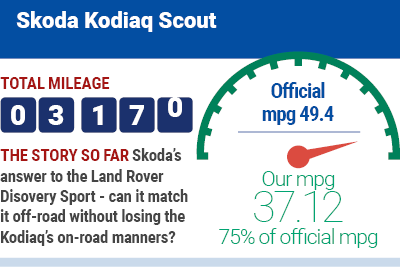 We’re planning to find out whether our Scout is a viable alternative to the Land Rover, or indeed the standard Kodiaq, in the updates that follow. What’s with all the snow? 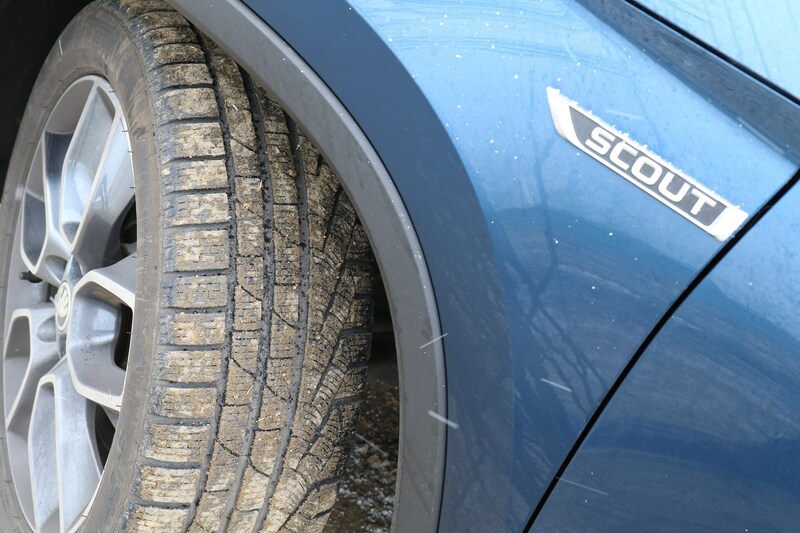 Given that our car arrived in January, Skoda was kind enough to send it with some winter tyres (Pirelli Sottozeros) to test with the car. 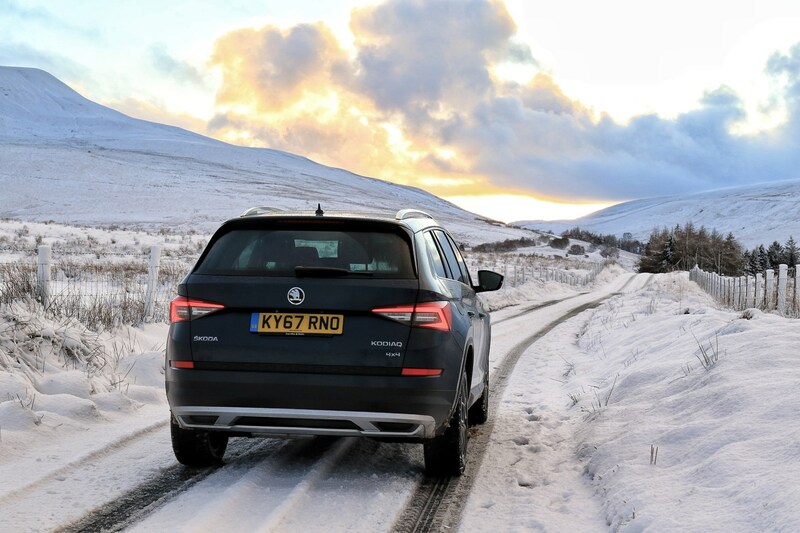 We decided to drive to Wales and find some snow to see how they fared - and so-equipped the Kodiaq was unfaltering. Even on patches of snow so deep the tyres couldn’t break through to tarmac, the Skoda pulled away cleanly, and managed to brake and turn without drama. A worthwhile winter upgrade. What equipment and options have we got? As we mentioned in the first update, the Skoda Kodiaq Scout is essentially an SE L spec car with a load of off-road kit added. That means it gets the largest 9.2-inch Columbus sat-nav system, all-around parking sensors, plus LED head-, tail-, fog- and daytime running lights. Of course, being a Skoda you can also expect some hidden practicality features such as a parking ticket holder in the windscreen, umbrellas in both front doors, and a variable height boot floor with loads of nets to hold things down. We reckon that’s quite a comprehensive package, but it’s worth reiterating that everything described here comes on the SE L car - which is £2,295 cheaper than our £36,330 Scout. There are a few notable things missing considering the high spec of this car too; such as picnic tables, remote-folding rear seats and a reversing camera, but all the essentials are there. Bolstering our long termer’s equipment roster are a few select upgrades - we couldn't go too mad with options because then the final asking price would have topped £40,000, attracting the higher rate of tax (£450 a year, rather than £140). In total our car comes to £39,250 and is really well-equipped, but given an unlimited budget we’d have been tempted by the extra light of a panoramic roof, plus the convenience of adaptive cruise and high-beam assist. Could you have picked a cheaper engine? Yes. The Scout range features 1.4- and 2.0-litre petrols, plus a 2.0-litre diesel engine with a choice of two power outputs. There is a difference of £4,000 between the basic manual 150hp petrol and the top 190hp diesel. Petrol is not a big seller for the Kodiaq Scout, so that narrowed the choice to TDI 150 and 190hp – the lower output comes in manual or auto form, the upper one is DSG auto only. The diesel range increases in roughly £1,000 intervals from 150hp manual, to 150hp DSG and 190hp DSG, meaning the top power output that we picked is quite a bit more expensive than the basic one. Is it worth the extra cash? I’m not overly fussed about having an automatic gearbox (although they are nice) but having run a VW Touran with the 150hp diesel engine, I always felt it wanted a bit more power, especially when loaded up with seven people. Given that the Kodiaq is a larger car than the Touran, with the additional weight of an all-wheel drive system, the 2.0-litre TDI with 190hp seemed to make the most sense. It has 400Nm compared with 340Nm, so feels substantially more muscular and takes 8.5 seconds to crack 0-62mph - instead of 9.9 seconds in the 150hp. Economy is exactly the same between the diesels too - Skoda reckons these cars can achieve 49.6mpg and 151g/km of CO2 (149g/km in the 150hp). The Scout has been a sturdy winter companion thanks to its heated everything and the superb teamwork of its all-wheel drive system and winter tyres. 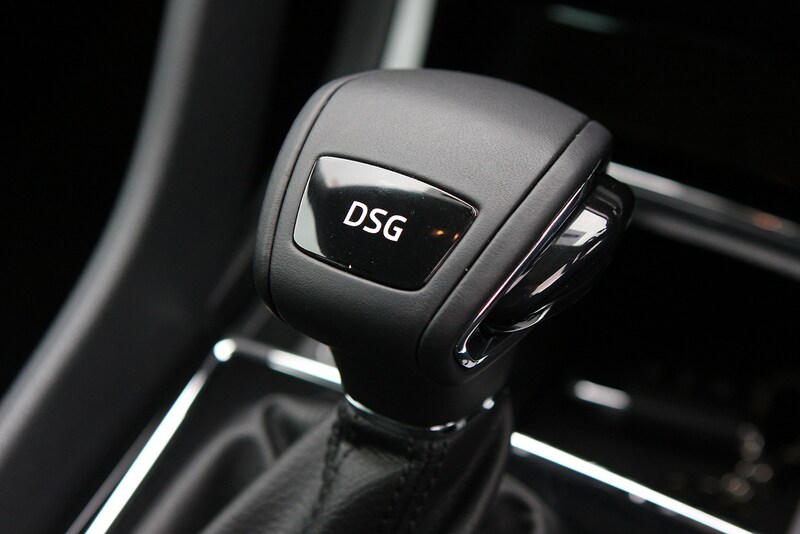 I also really appreciate how the DSG transmission hangs onto its gears – when you put your foot down on a motorway slip road it hauls you along in fourth rather than noisily dropping down to third or second. That sort of brings us on to the final point – while I reckon the 190hp diesel is the perfect engine for the Scout, it’s noticeably noisier in our car than other in other VW group cars in which we’ve driven it, even with the gearbox doing an admirable job of keeping it out of its clattery upper reaches. Winter. It comes but once a year (or technically twice, I suppose) and its icy wrath makes the simple business of getting around in your car resolutely horrible. But it doesn’t have to. A Skoda Kodiaq Scout like ours can be specified with all sorts of frost-busting hardware, and as I alluded to in the previous update, we’ve ticked pretty much every box to see which of it’s worth it and what’s not. 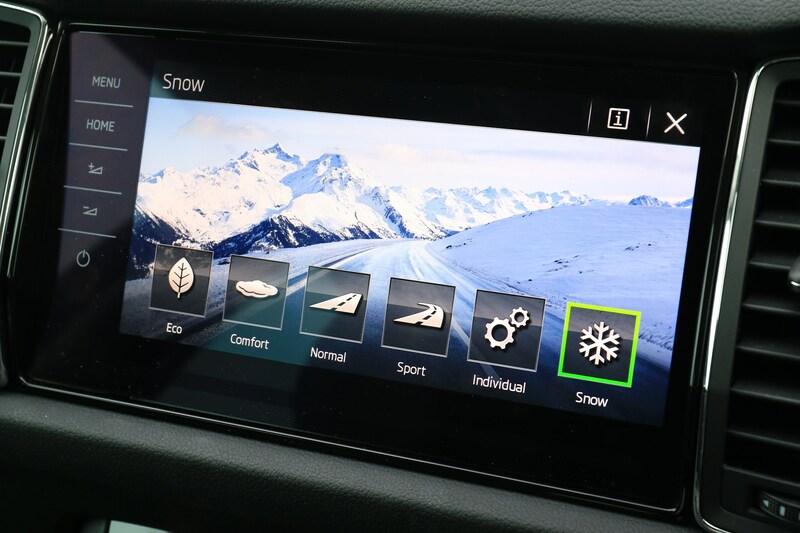 First things first though – we need some frozen roads on which to test the all-wheel drive’s bold winterproof claims, and of course the tantalising Snow driving mode. 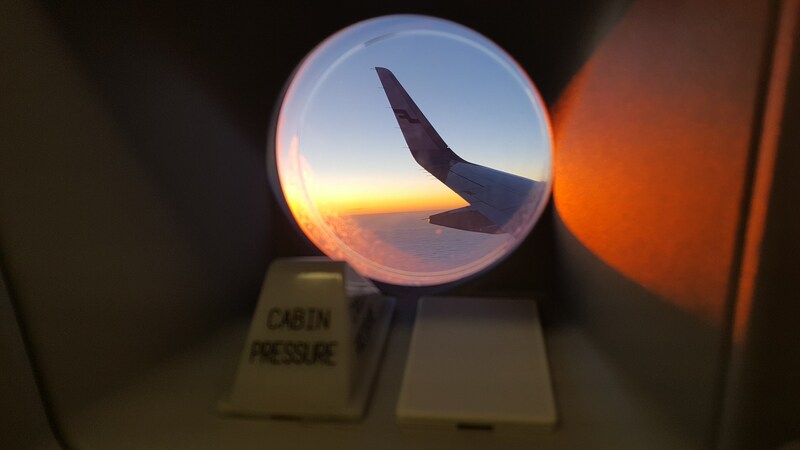 As the first quarter of 2018 wore on it seemed less and less likely we’d get any of that in the UK (more on this later) so we boarded an aeroplane to the Arctic Circle where a sub-zero test track beckoned. 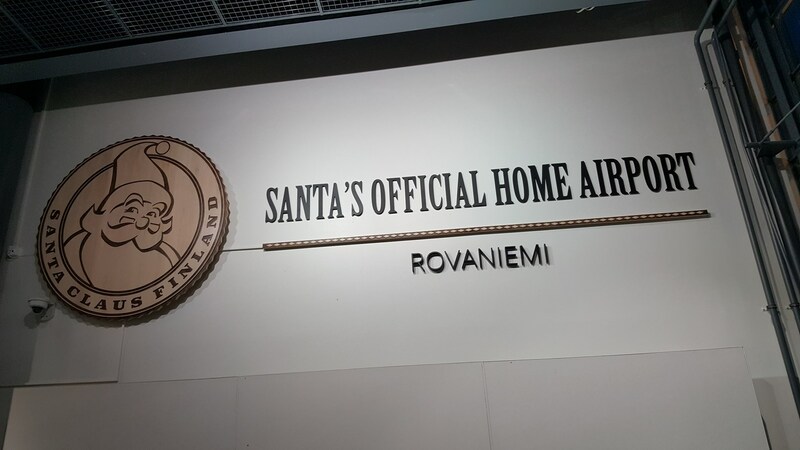 Why didn’t you just drive your car to Finland? I genuinely looked into that but it would have taken more than a week, required intimate knowledge of Finland’s winter tyre regulations, and also I’d definitely get lost in the middle of nowhere. 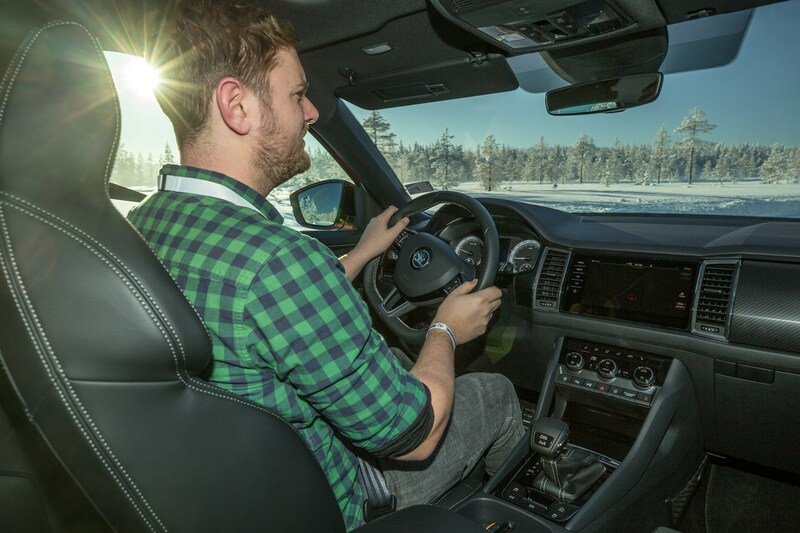 Luckily Skoda had already planned a winter driving event in Rovaniemi (famous for being Santa’s manor) in my exact spec of car, so I decided to tag along. 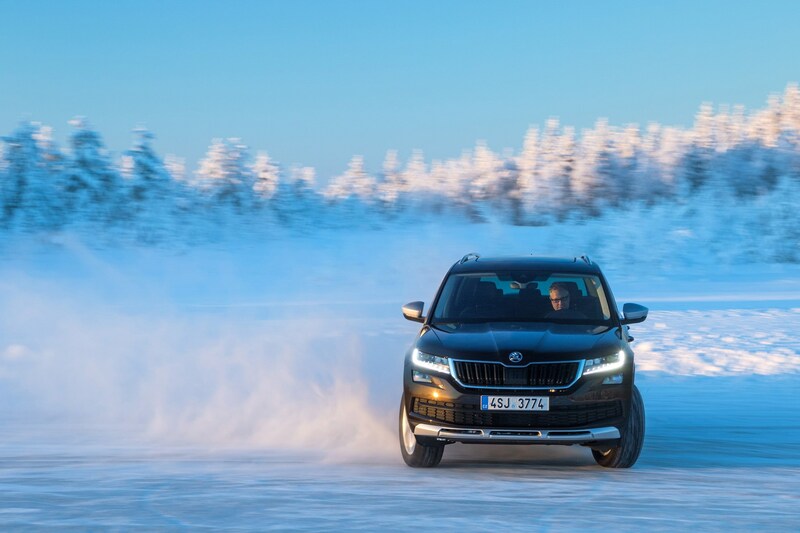 Waiting for us at the end of a day’s flying was a frozen lake complete with a handling track, an off-road loop and a purpose-built drifting circle where we could stretch the Kodiaq’s abilities. After dinner and a big sleep, obviously. 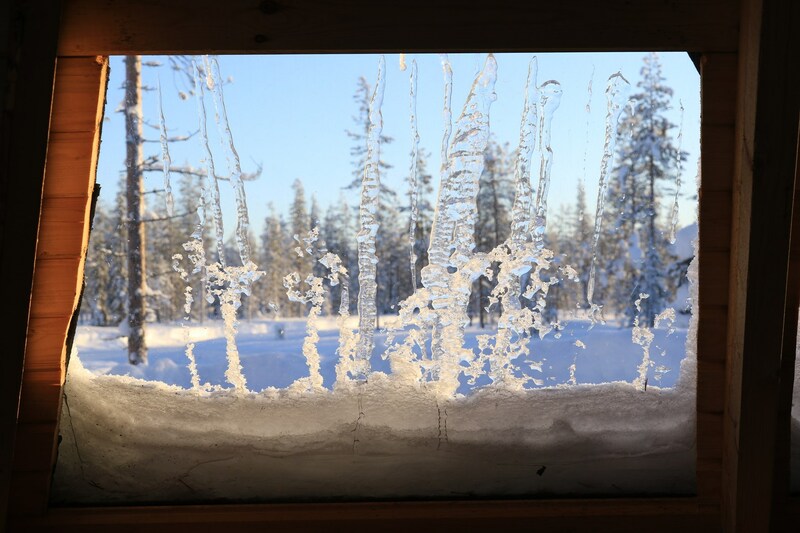 Very cold indeed, with daytime temperatures in the minus teens dropping to a scarcely believable -27 deg C when the sun dropped below the horizon. So cold in fact that the snow was apparently gripper than what we get in the UK. 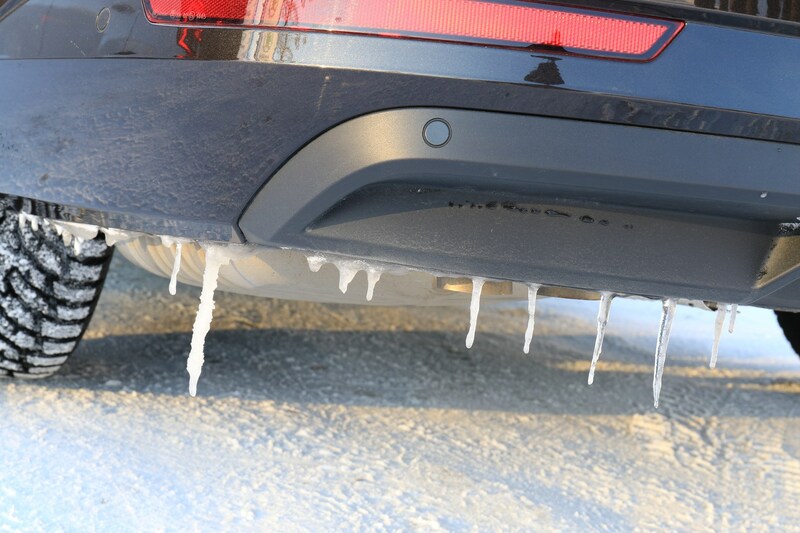 Snow and ice aren’t occasional inconveniences in the Arctic freezer, they’re a near permanent fixture, so people equip their cars in a way that ensures all-round usability. 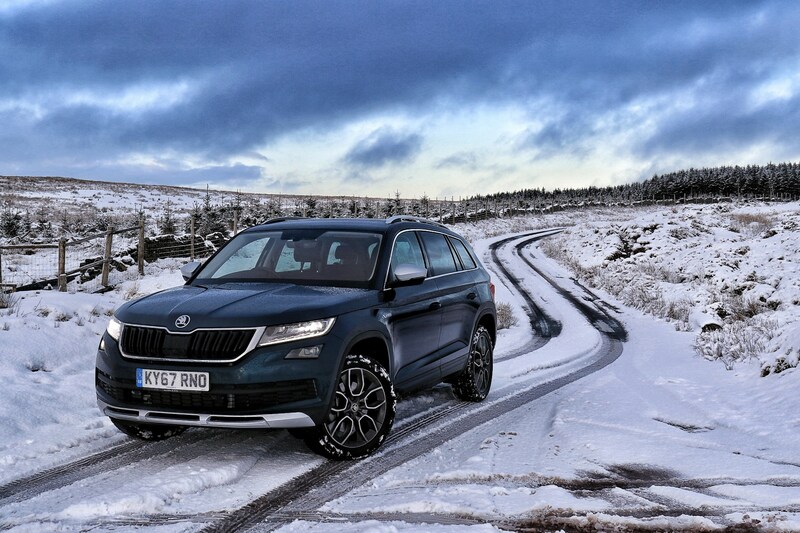 For us that meant attaching fully studded snow and ice tyres to the all-wheel drive Kodiaq Scout – substantially more preparation than anyone in the UK would be expected, or legally allowed to make. Hang on, doesn’t that make this winter test irrelevant? 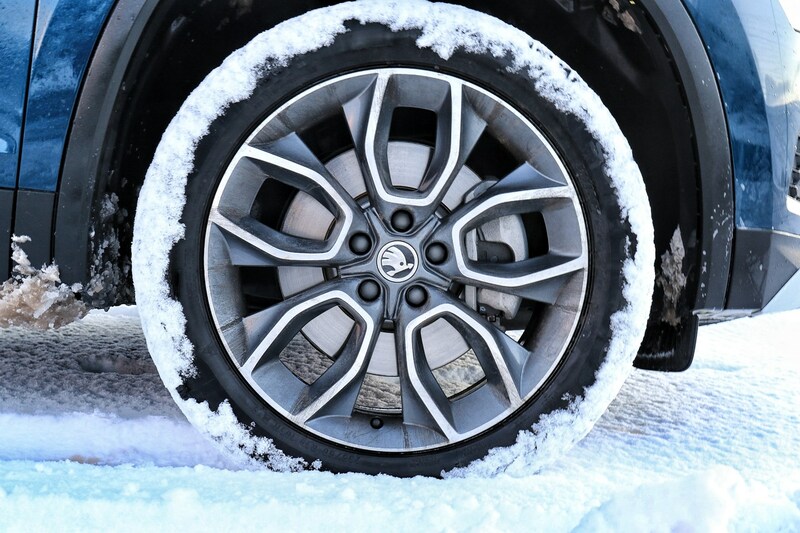 It's true that this heavy-duty rubber would give the Kodiaq way more grip on snow than even a winter-tyred version in the UK. 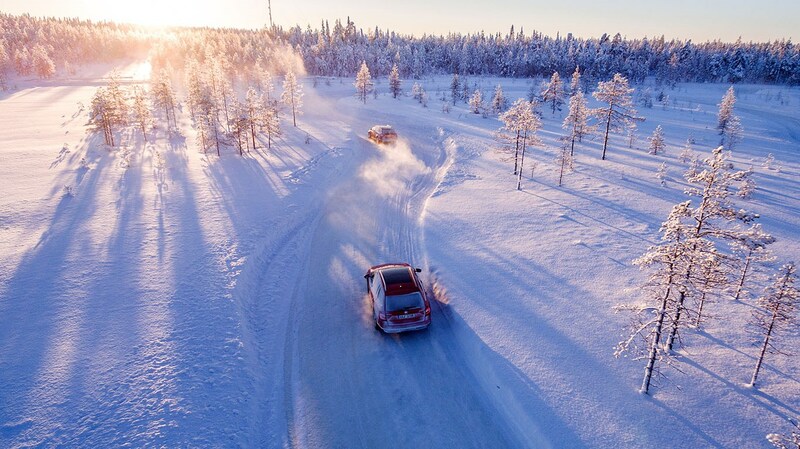 However, the conditions in Finland were so extreme, I reckoned the driving experience would be broadly comparable to driving our Sottozero-equipped car on slush. We had a long day of low-friction driving ahead so after a huge breakfast we donned several coats, picked up the keys for a Kodiaq Scout and hit the road. 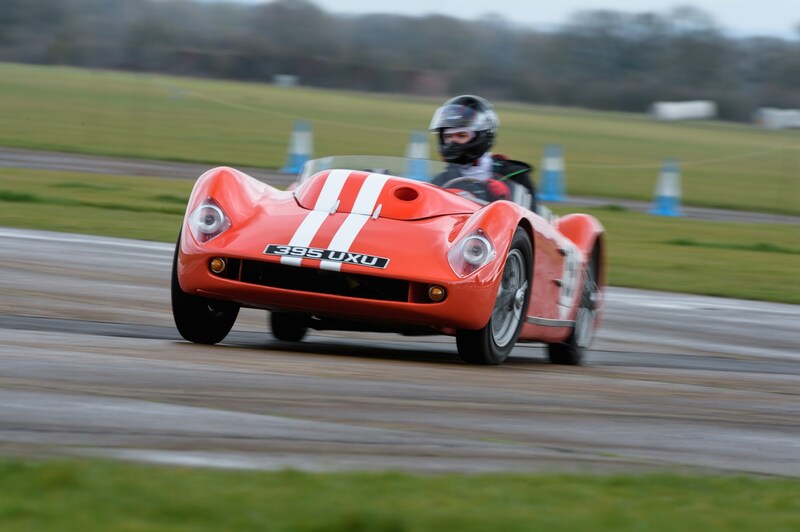 The first activity was a blat around a tight handling circuit where we got to experiment with the different driving modes to see which worked best on slippery surfaces. 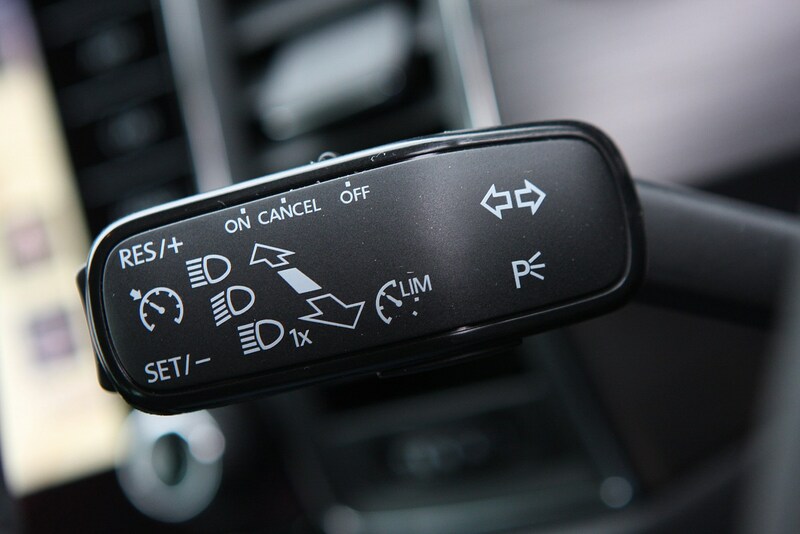 In the Normal and Sport drivetrains the Kodiaq’s traction control gets involved at the slightest hint of a loss of control – handy for traversing difficult terrain slowly and securely, but adding additional stutter when pulling away from a standstill, which is annoying. 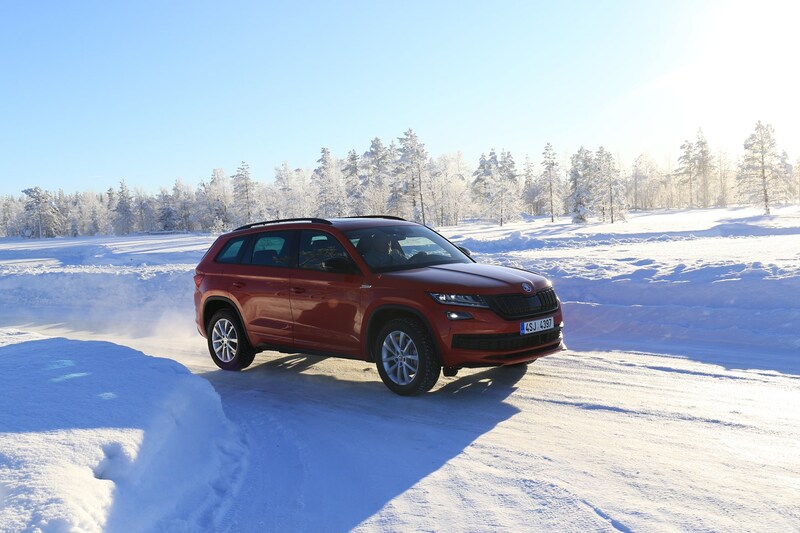 If you want to go a bit quicker there is a Snow mode that slackens off the electronic aids to allow a bit of slip from the Kodiaq’s rear axle – not encouraging Tokyo Drift style powerslides, but giving you more freedom before the traction control system tidies things up with a dab of brake here and there. And on less flat terrain? After that brief warm up we headed out into the woods on a lumpy, bumpy off-road course, including tight technical turns and a steep incline to tackle. 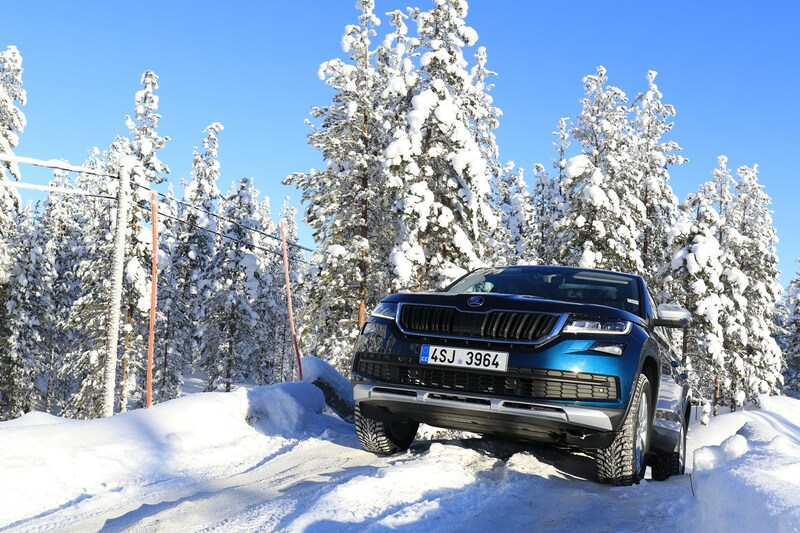 On all obstacles the Kodiaq Scout felt imperious, finding grip on seemingly glass-like surfaces and charging up the precipitous hill with ease. Then on the way back down the slope the standard-fit hill-descent control kicked in and ensured a slow and steady return to level ground. You mentioned a drift circle earlier, what’s the point of that? 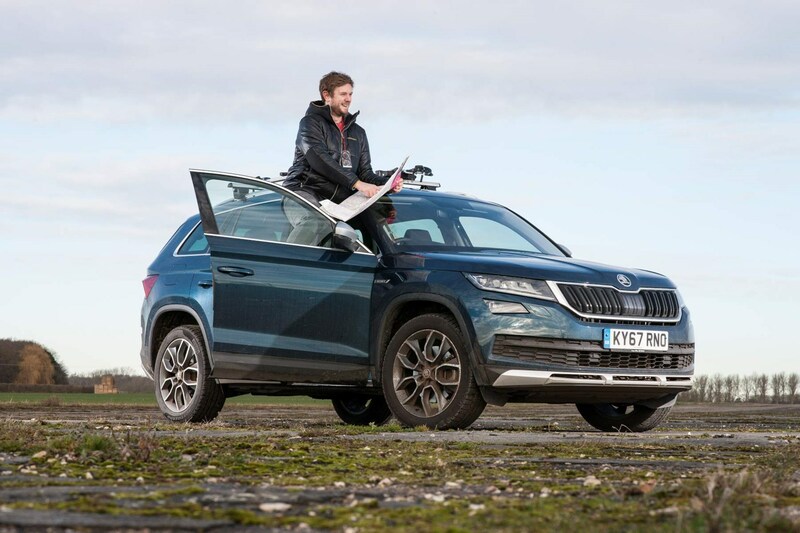 Look, I’m not labouring under the illusion that people will buy a Skoda Kodiaq to recreate their favourite moments from Formula D, but being able to test one on the absolute limit gave me a lot of confidence in the SUV’s all-wheel drive system. 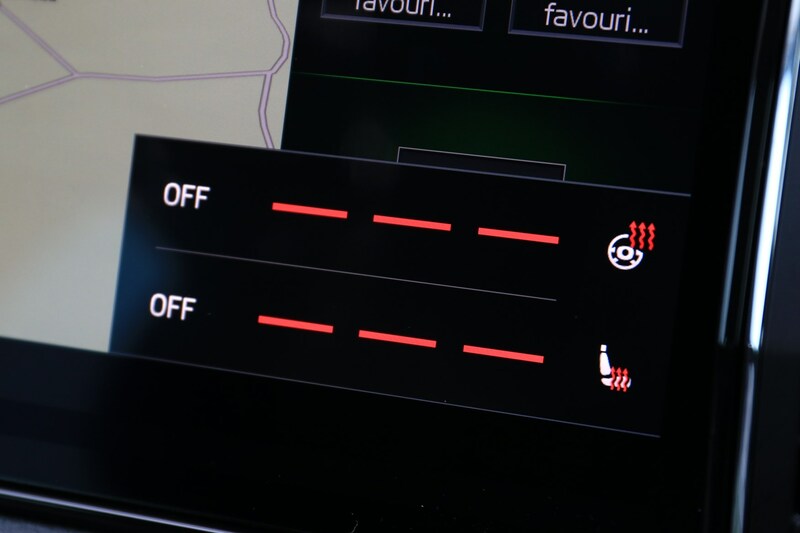 The traction control has two levels of offness – a bit off and a lot off – but in reality it’s always there to step in when you run out of talent. 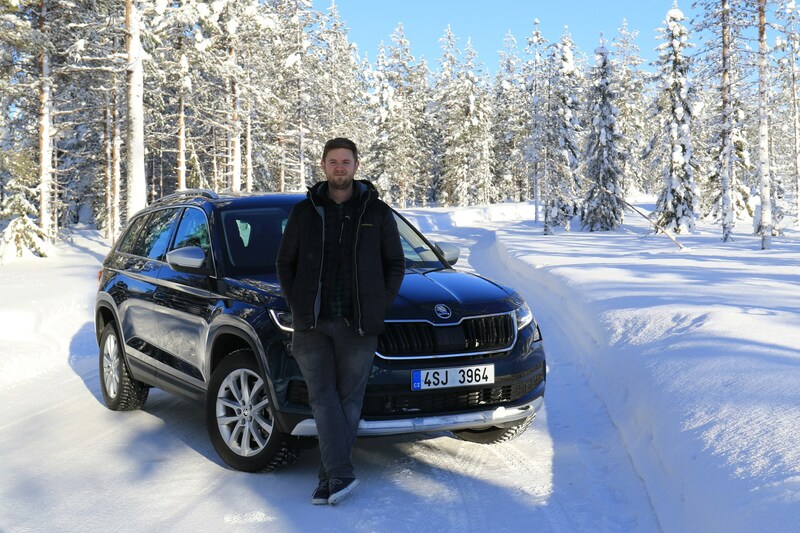 I drove both a Kodiaq and an Octavia on the drift circle and weirdly prefered the Kodiaq – its additional bodywork allowing for a greater weight transfer and more exciting drifts. Even in the second setting you’d have to be pushing very hard indeed to get into any trouble, even on very loose grip surfaces. And no, the person in that picture isn’t me. 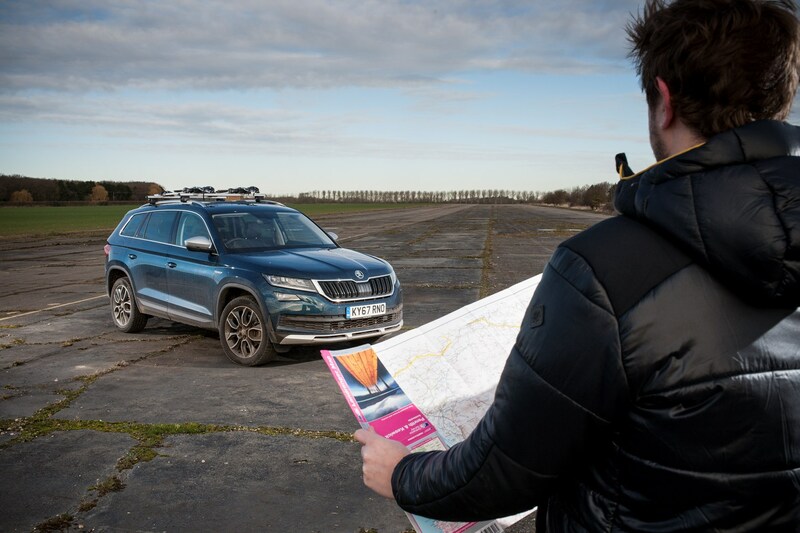 As well as an exciting fast lap with racing legend Hans-Joachim Stuck in an Octavia vRS, I also spent a bit of time in the new Karoq and found it similarly impressive off-road. Equally useful was a quick steer in the considerably more athletic-looking Kodiaq Sportline, with its boy-racer bodykit, and the sneaky preview I had of of the digital dial set-up you’ll soon be able to pick as an option in the UK. Overall, it was an incredibly strong day, and cemented Finland as one of the most beautiful countries in the world. Enough travel blogging - wasn’t there quite a lot of snow in the UK? Well yes and annoyingly it came largely while I was in Finland, but luckily stuck around long enough for me to test our car and its winter tyres. 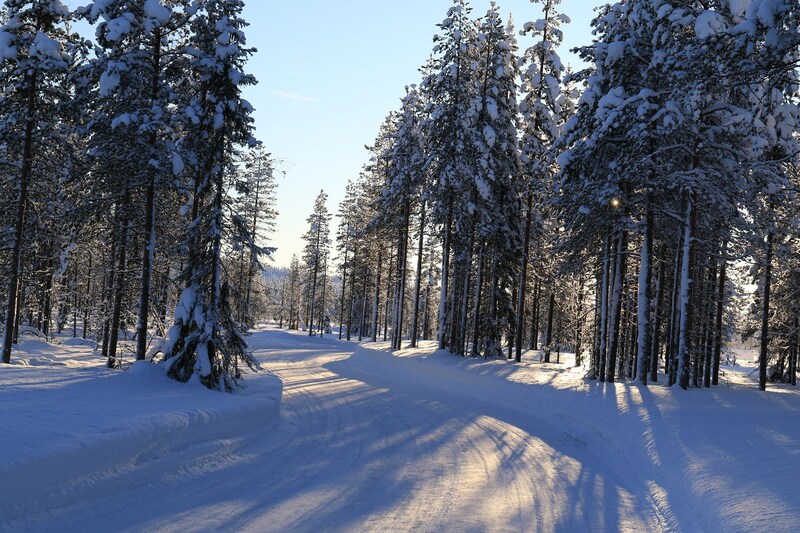 Regular readers of these updates will know I’ve already driven it on snow, but having had a couple of months in the car and the experience of driving in the Arctic Circle, I felt better able to critique the car and its Pirelli Sottozero tyres. 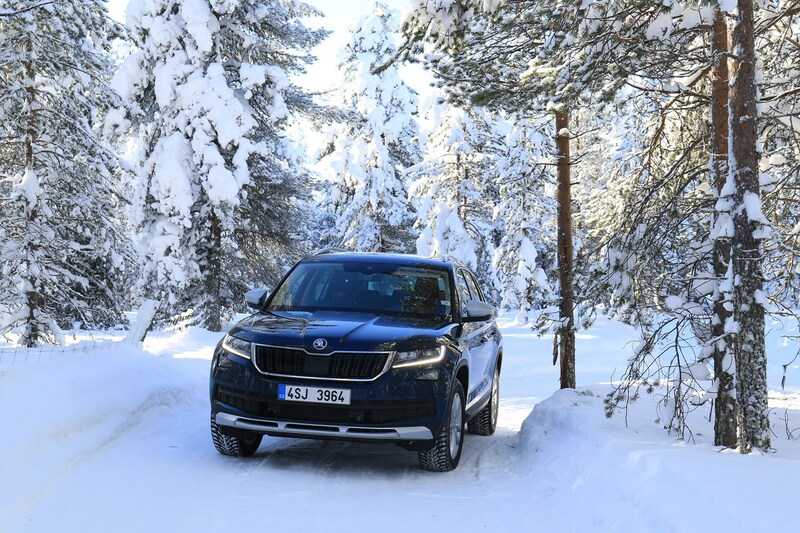 In short, our Kodiaq was just as impressive at home as it was in Finland – smashing through snow drifts large enough to leave a build up of ice in the bumper, and carving a track for other motorists into at least two feet of snow down the the lane I use to get to the office, like some sort of amateur Mr Plough. I also helped rescue another motorist who was stuck in deep snow by digging them out with a flip-flop (neither of us had a shovel). ...Anyway, what about those options you mentioned? Ah yes – we’ve got three cold weather survivalist mods of note – heated front and rear seats (£200), a heated wheel with gearshift paddles (£150) plus the all-important heated windscreen and washer nozzles (£335). 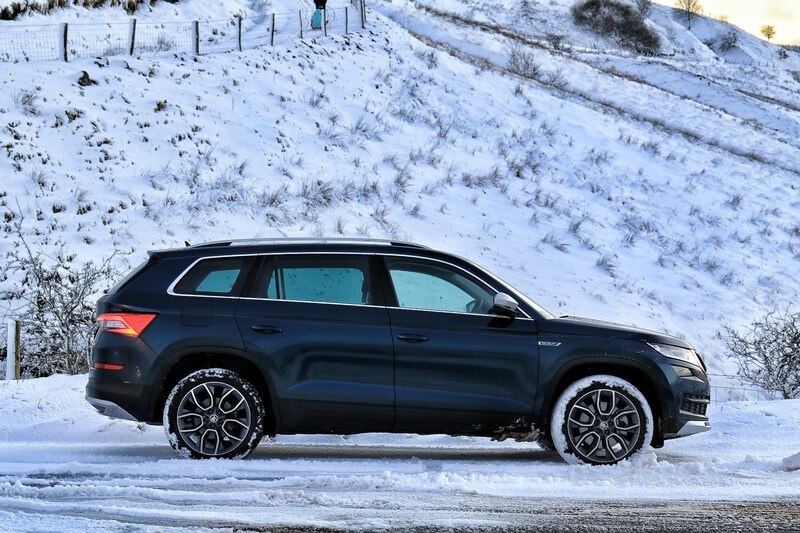 So equipped you’re able to simply sit in the Kodiaq on a frozen morning and wait for everything to melt – or if you’re in a rush there’s a scraper hidden under the fuel cap (more on this later). 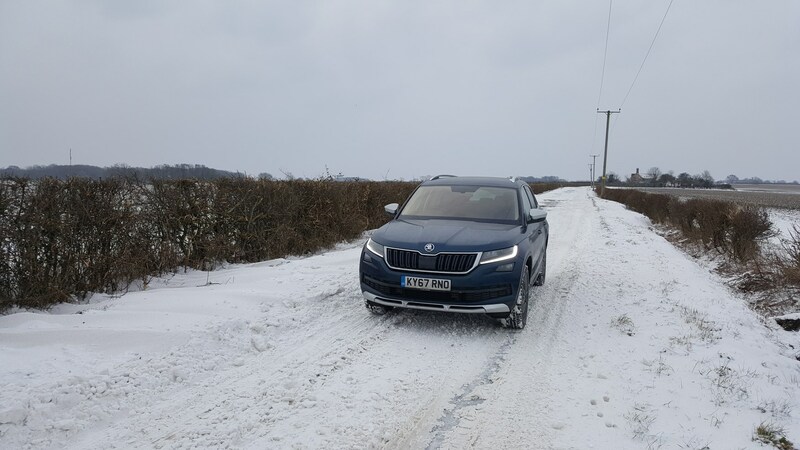 Basically our Kodiaq Scout is a winter weapon and unsurprisingly my more rural colleagues seem keen to borrow it as soon as a single flake of snow is spotted. Seriously though, knowing you can get around no matter what the weather is well worth the expense. These drier months already seem very boring. Which seven seat SUV is better, the Czech or the German? Curiously enough one of the Skoda Kodiaq Scout’s biggest competitors comes from parent company Volkswagen in the form of the Tiguan. 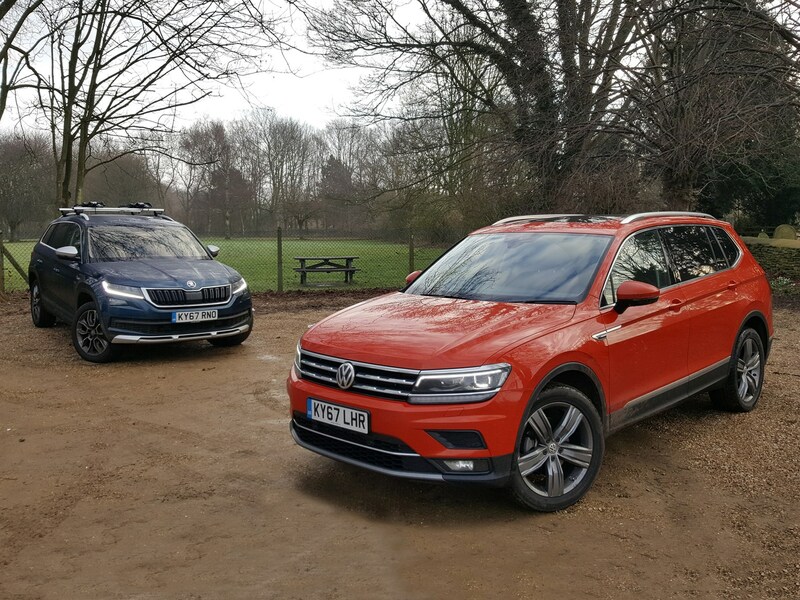 Where the Wolfsburg car previously fell down was the fact it was only a five-seater – two fewer than the Kodiaq - until, that is, the launch of the larger Tiguan Allspace. This car is longer from front to back and also between the axles, opening up more interior room for two extra seats. 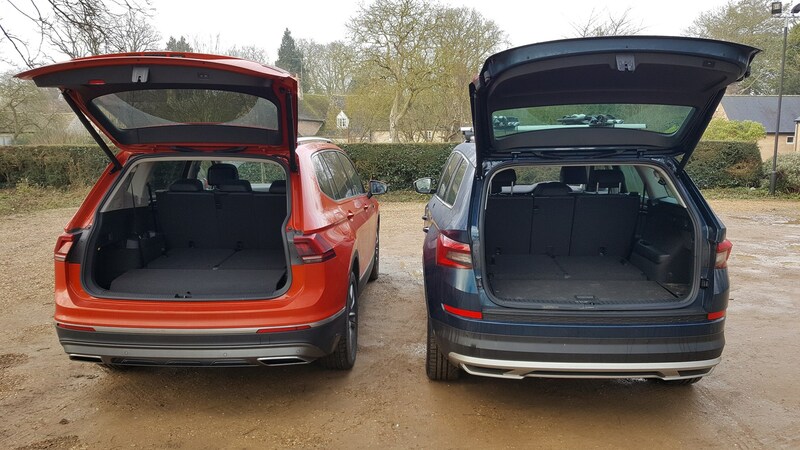 As you can see from those figures the Allspace is larger externally than the standard Tiguan and the Kodiaq but has a shorter wheelbase (the distance between the front and rear axles) than our car, meaning less interior room – in theory. 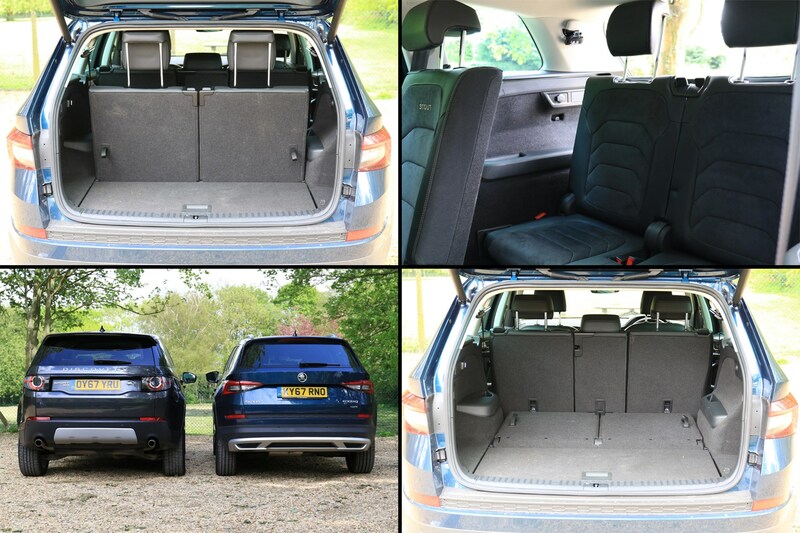 It also offers more bootspace than the five-seater Tiguan but less than the Kodiaq in all configurations except one – on paper the Tiguan Allspace has more room than our Kodiaq in five-seater mode, as demonstrated above. That’s odd because it’s got less overall with all five seats folded, so in theory the space itself is smaller. 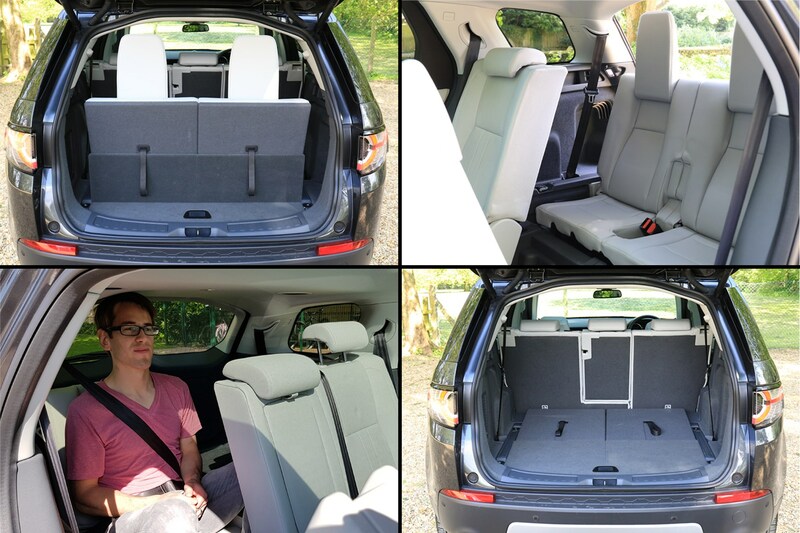 It’s also about the same amount of room you get in a standard five-seat Kodiaq, which doesn’t have folded seats eating into its loadspace. We’ll update this when we know more, but for now it’s a bit of a mystery. What about the third row? This is the big one and in reality the reason you’re here because it’s the crucial difference between the seven seat Tiguan and Kodiaq. 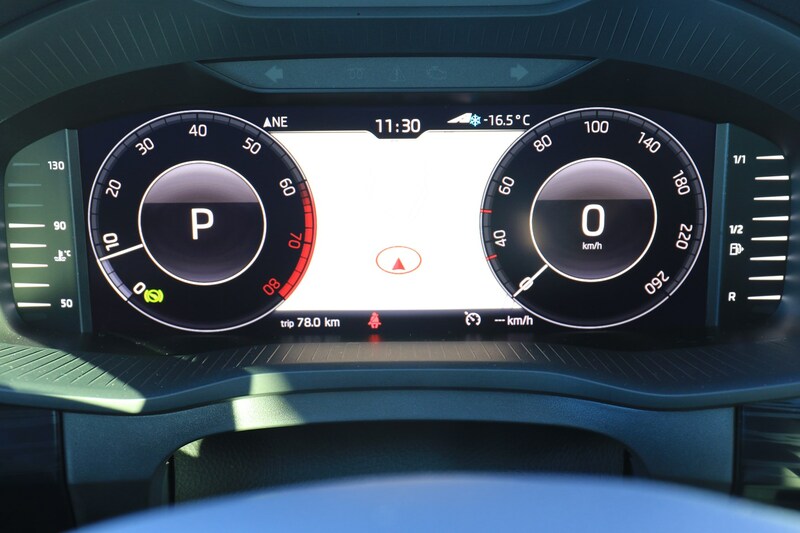 Alas, VW doesn’t offer an official ‘effective headroom’ measurement for row three like Skoda does (the line above indicating 905mm) but there is a figure for the second row, which is 13mm less than the Kodiaq, so it stands to reason you’ll have less space in the third row. Obviously that is in no way scientific enough for us so we unpacked the Parkers Third Row Measurement Tool © (Finance Editor, Chris Lloyd) and undertook some proper testing. Chris is the ideal tool for this job because he A) has a strange fascination with small spaces and B) is much shorter than me so can more effectively assess the third row of seven seaters - at my height no third row seats offer enough room. They’re all awful. Chris’s verdict? The Kodiaq is bigger. Case closed. Almost exactly the same, except the engine in the Tiguan is a bit quieter and speaking entirely subjectively, it rides slightly better too. 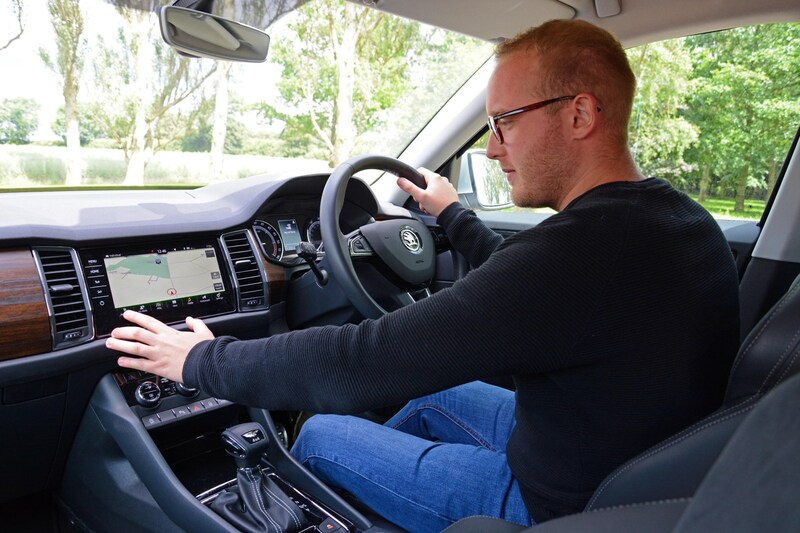 From the driver’s seat we reckon the Kodiaq has the nicer interior – the Tiguan is just like a big Golf and is fairly unexciting to look at, with a lot of dark grey plastic. 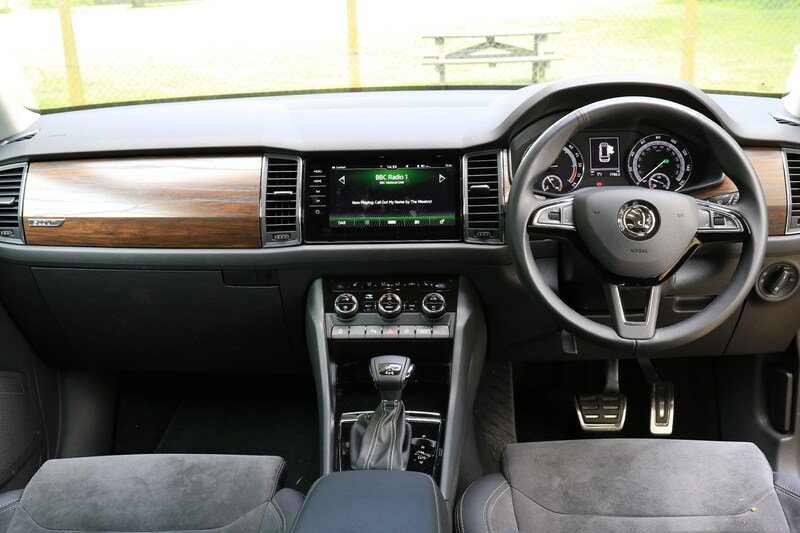 Our Kodiaq conversely has some (divisive) fake wood trim to lift the ambiance a little. 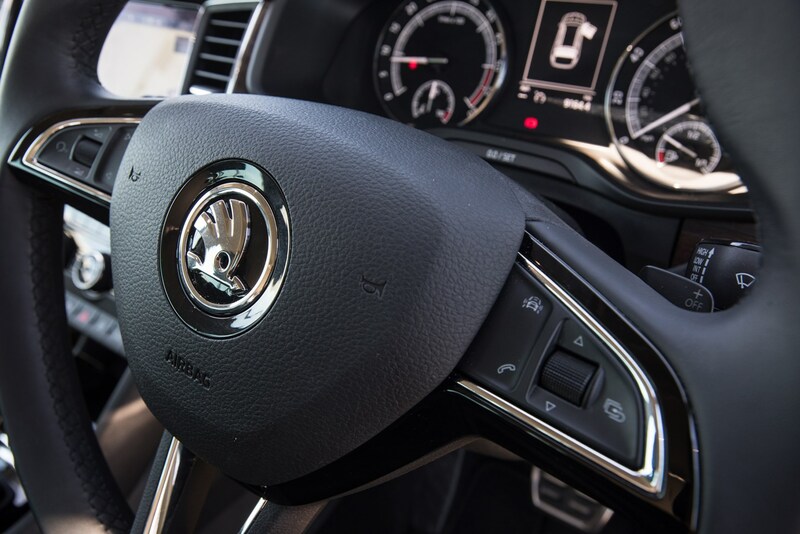 Two things though, the Skoda’s door handles look very cheap, and higher spec Tiguans come with the 12.3-inch digital dashboard as standard, which is not necessarily a selling point, but worth highlighting. Given that that VW is supposed to be the more 'premium' of the two makers, we think you'll be suprised by how much Skoda has closed the gap on the German rival. 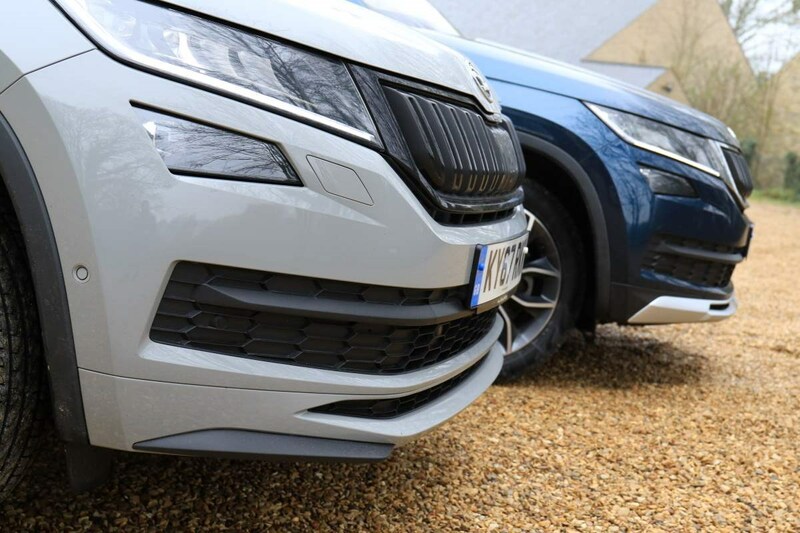 Skoda Kodiaq vs VW Tiguan - which is cheaper? Basically, the Skoda Kodiaq. Our range-topping Scout long termer is £455.61 a month compared with the mid-table Tiguan Allspace SEL we’ve got on test, which is £478.57. Pick a top spec R-Line car and that goes up to £516.93. If you’re willing to put up with a base spec and engine you could drive a seven-seat Kodiaq for £269.16 a month, or £336.83 for the Tiguan. All of the figures above are based on a 48-month PCP finance deal encompassing 10,000 miles a year, and a £3,709.50 deposit. Styling is subjective of course but we think the Kodiaq is the more handsome car – that is unless you want orange paint, in which case the Tiguan Allspace is a better bet. I’ve invented a game in the Parkers car park where I try and find a space next to the perfect partner for whatever test vehicle I’m in, thus creating an ideal two-car garage. Then I post a picture of it on Twitter and three or four people get a laugh out of it. Bear with me, this gets more interesting. This week for example I deposited a Subaru WRX STI next to a VW Amarok (a special Dark Label version, no less) therefore creating a fantasy fleet for a farmer looking to spend a big bingo win. 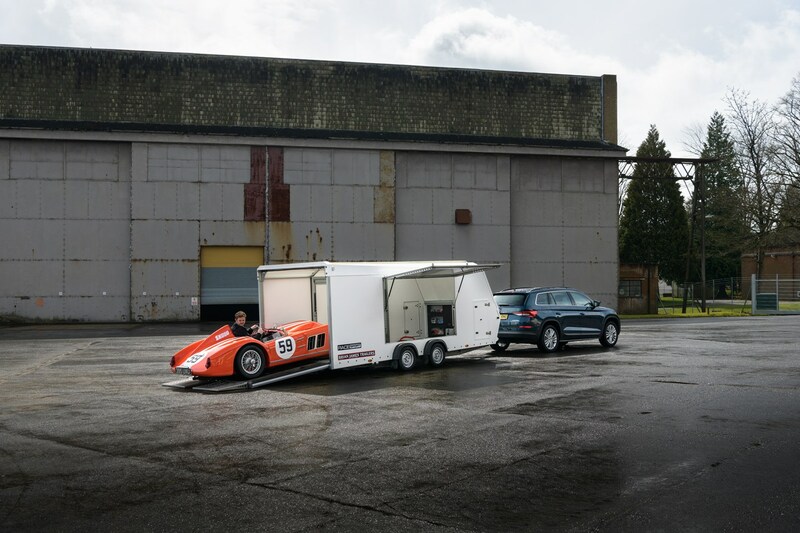 Every now and again an absolute dream combo comes up, such as the picture below; a Skoda racing enthusiast’s dream garage, containing a Kodiaq tow car and a 1950s factory racing prototype. Which I’m now going to drive. This all originated from a need to find an exciting way to show off our Kodiaq Scout’s mighty two tonne towing ability. After scratching my head for ten minutes or so, I couldn’t come up with a single interesting thing that I could hitch up to our car. Try it yourself. Everything you can tow is boring. Then a couple of days later Skoda’s press office rang and asked if we wanted to drive their historic 1100 OHC race car to celebrate its birthday. Aha, I thought, what a happy coincidence – race cars are not at all boring. So you join me at the point of lowering myself into an irreplaceable, two-of-a-kind prototype with cross ply tyres so skinny I’d reluctantly fit them to a wheelbarrow. And it’s pouring with rain. Was this a good idea? Hang on, Skoda made racing cars? You’ll have no doubt seen Skoda’s more recent rallying prowess but back in 1957 a skeleton factory works team from Mlada Boleslav produced this slinky Red Racer, despite that fact that the manufacturer had more-or-less withdrawn from motorsport. In its competition debut, a race around the municipal circuit near the factory, driver Miroslav Fousek took the victory. Success followed in Lidici and then Louny, plus the Leningrad Grand Prix of 1959. Victories continued throughout eastern Europe until around 1962 – when Skoda shifted its focus from prototypes to single-seater Formula 3 cars and rallying. Only two of these cars remain – one resides in Skoda’s museum in the Czech Republic - while 395 UXU was purchased in 1968 and driven back to the UK. It changed hands several times before eventually in 1998 Skoda bought it at an auction for £46,600. How does the cabin compare with the Skoda Kodiaq Scout? For a start it’s a lot smaller, having been tailor-made for a whippet-thin 1950s racing driver who was a bit shorter than my six foot two inches. To get in you step over the low door (don’t bother opening it), stand on the seat and then slide your feet down under the dashboard, like getting into a kayak. Or putting on a big pair of red trousers. I can’t stretch my legs out anything close to straight and my feet locked upright, like I’ve just trodden on Lego, making finessed pedal movements a bit of a struggle. The most comfortable position involves flattening the accelerator and extending my left foot past the brake pedal. I suspect the team that maintains the car would disapprove. 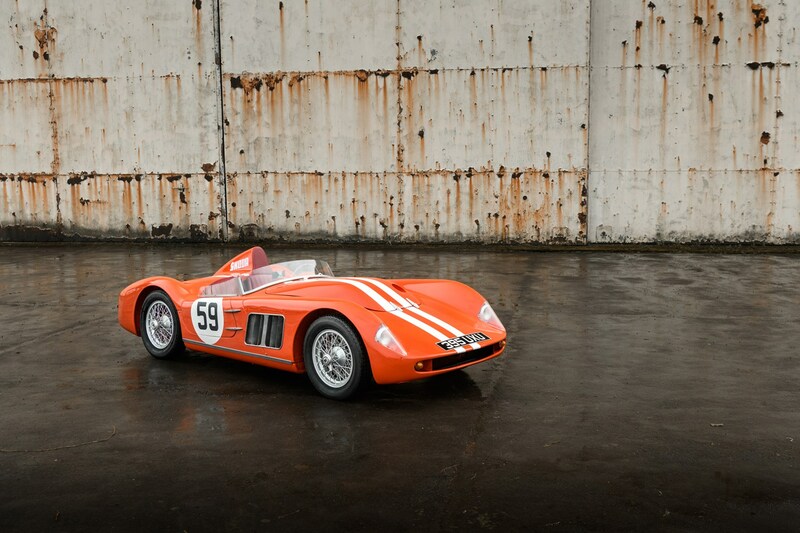 Not inherently so, but put bluntly the 1100 OHC is not a car you’d want to get it wrong in – thanks to its thin-wall welded tubular chassis and glassfibre bodywork. Also there are no seatbelts, and there’s more of the driver outside the car than in. Our long termer has a five-star Euro NCAP rating – I doubt the Red Racer does. 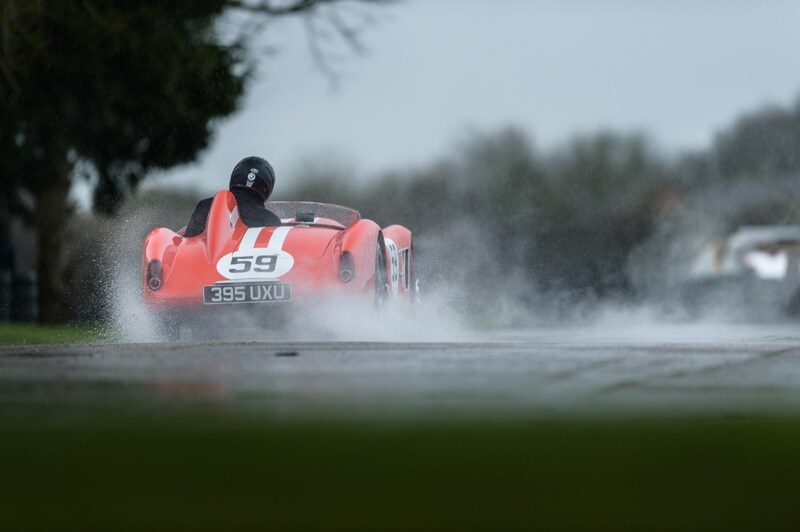 The rain at the Bicester Heritage Centre has stopped but the track is still soaking wet in places so I make a mental note to avoid finding out how well 1950s tech copes with standing water. Under the bonnet is the same basic motor from Skoda’s small family car of the 1950s, the Tudor sedan. A 1.1-litre, four-cylinder item putting out 93hp at 7,700rpm and going on to a redline of 8,500rpm. Similar figures to a contemporary Fabia, although of course that car has a turbo. 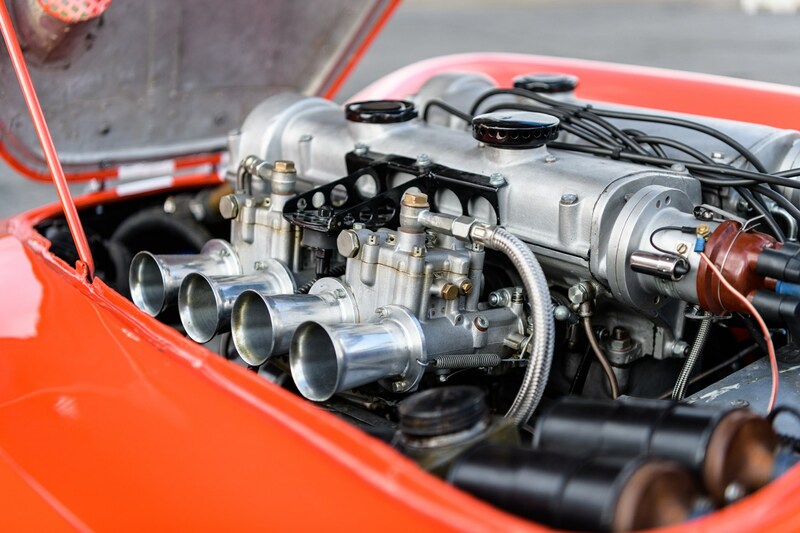 This engine is naturally aspirated and it’s had a lot of work done to it - a new cylinder head with two camshafts, hemispherical chambers, doubled-up spark plugs, coils and distributors, and a pair of twin-choke sidedraught carburettors. Not impressed? That output doesn’t sound a lot but bear in mind this car is seriously light, tipping the scales at 550kg, so it boasts the same power to weight ratio as a modern Octavia vRS 245. Does it go like one? Yes. 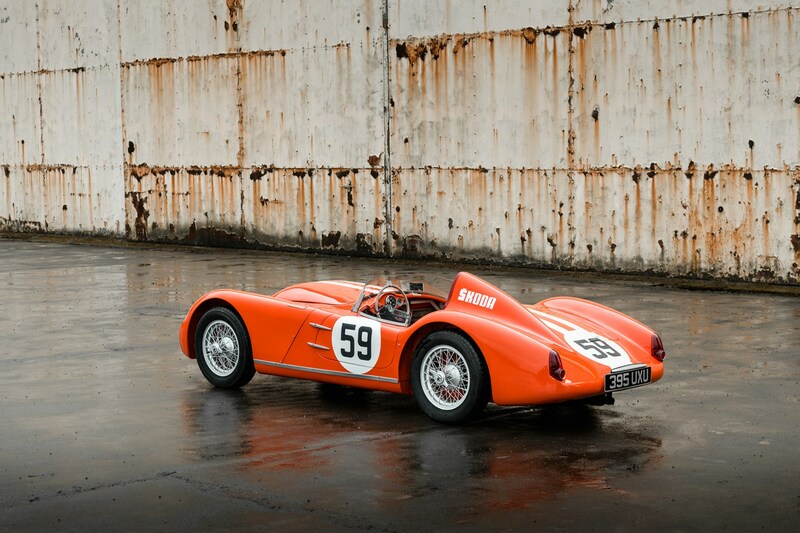 Like most race cars the 1100 OHC is unhappy about sitting still – but once you’ve wrestled it into first gear and pulled away without stalling it loosens up, and feels positively raring to go. 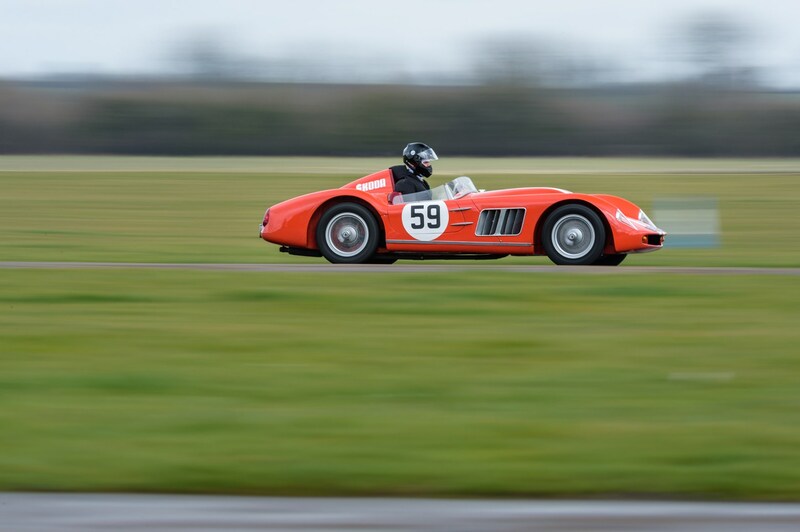 On my sight-seeing first lap the intimidating nature of the car beings to fade and at a relaxed pace this historic racer is relatively modern in the way it drives. 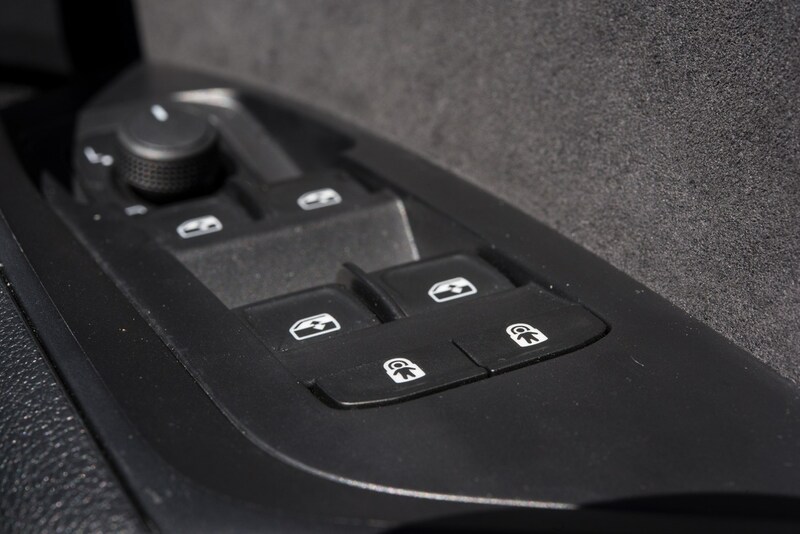 The controls are pretty heavy and require firm inputs – the gearshift especially, which feels very sweet in its action as long as you’re prepared to absolutely heft it between the gates – something that feels very wrong in a vehicle you’d need a mortgage to buy. The brakes are inert until you lean on the heavily sprung pedal, at which point they wake up. Modern cars offer a strong initial bite that needs easing off before the corner, but these are the other way around – you hammer the pedal before you need to slow down, and wait for the drums to eventually do their thing. How does the Skoda 1100 OHC handle? The front end feels glued to the concrete track, so understeer really isn’t a feature. The rear end shuffles around if you pile into a corner too fast but get it right and the Red Racer feels amazingly poised, your cornering angle easily influenced by the super-sharp throttle. With a neatly balanced car and largely misplaced confidence I go for a stab of gas on the exit of the last corner before the straight and manage an untidy slide. I let the wheel spin through my hands and the string wound around the rim sandpapers my palms. Then one of the spokes smashes into my thumb as I go to straighten up. I decide to hang onto it after that. A colleague later informs me this is Old Car 101. Accelerating onto the main straight and feeling like I’ve got a grasp of the braking distance at the end, I go for fourth gear – the tacho has stopped working so I judge the shift point from third by the noise – which is fantastic, by the way, raucous and raw with the whining gearbox laid over the top. I don’t dare look at the speedo but reckon it’s a fair way short of the top speed before I’m braking. I can’t imagine how much runway it’d require to haul this car up from 124mph but I suspect you’d need a lot. And some neoprene pants. After not enough time I’m called in for good and it’s someone else’s turn. 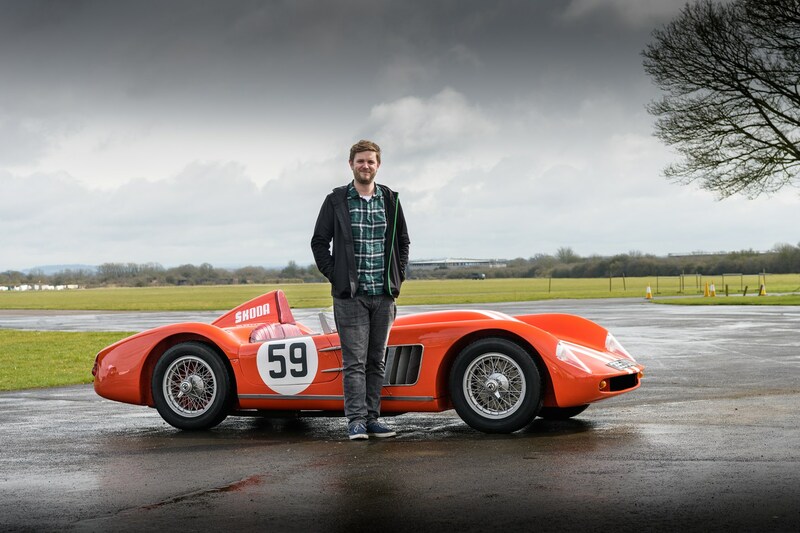 The 1100 OHC is in equal measure exhilarating and terrifying – somewhere between a takes-no-prisoners superkart and a progressive-but-still-precarious Caterham. And that’s when you’ve got an easy, empty circuit to drive it on – to race a car like this would require nerves of pure vibranium. For many years Skoda’s strapline has been ‘Simply Clever’ – indicating its passion for no-nonsense, uncomplicated cars. Thing is, in 2018 the Czech manufacturer declared bold plans for greater electrification, more SUVs and the roll-out of autonomous driving. These new cars may well max out on the clever part, but they sure don’t look simple. 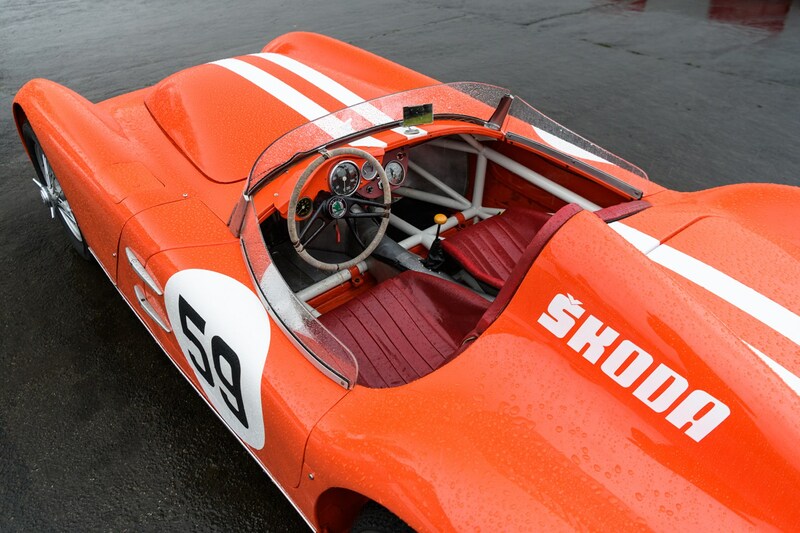 What a good opportunity then to rewind to a time when Skoda’s racing division offered the ultimate in clever simplicity – a car weighing barely half a tonne that offered terrifying speeds to brave enough drivers. Happy birthday, 1100 OHC. 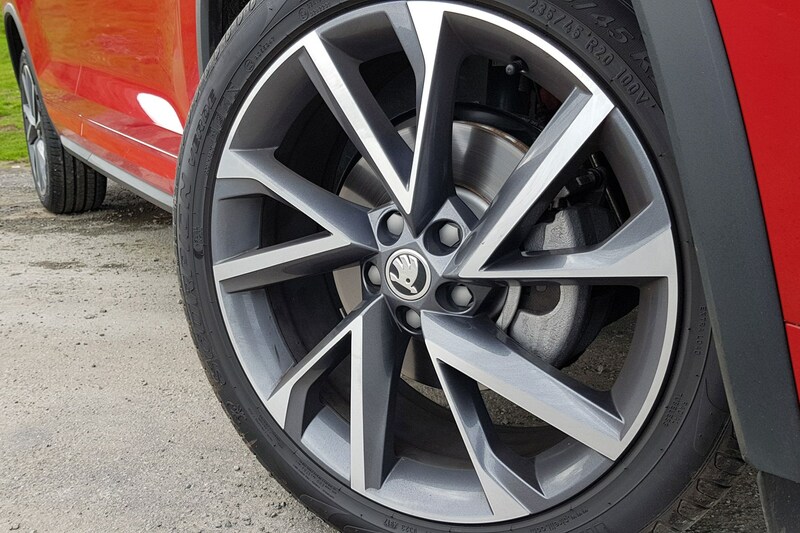 Skoda offers two range-topping trims, which is best? 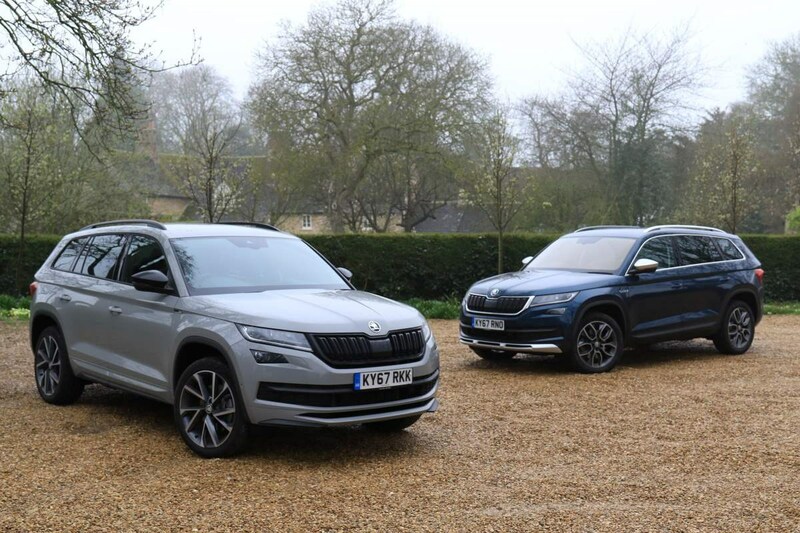 If you want a Skoda Kodiaq with a bit more personality than a standard car then there are two choices at the top of the range that’ll suit you – called Scout and SportLine. Neither has access to any different engines or suspension so the driving experience remains unchanged over the standard car, but the first (our long-termer) has been given an enhanced off-road look, while the SportLine offers sleeker, more performance-orientated styling. From there though the two trims diverge a bit with the differences largely down to interior and exterior styling, as described below. 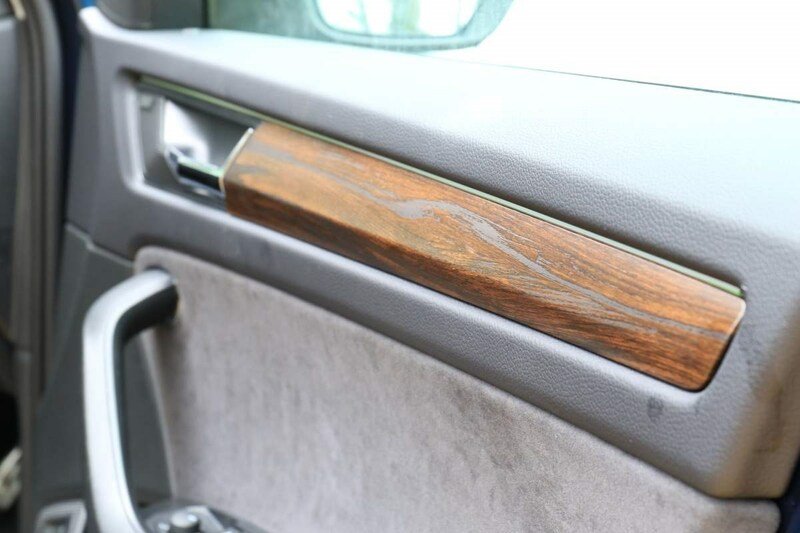 The Scout and SportLine interiors were equally divisive in the Parkers office, with most of the team (incorrectly) unable to enjoy the fine wood finish in my long-termer, or the incongruous carbonfibre effect in the SportLine. Those one-piece bucket seats stand out too, especially when viewed from the second row, where the addition of a seatbelt cut out makes little to no sense in a family SUV. Do they cost the same? Pretty much – our 2.0-litre 190hp 4x4 Scout retails at £36,210 while the equivalent SportLine is £36,565. On PCP finance the SportLine will cost you £10 a month more (£461.54 vs £451.76) based on the same deal (48 months, 10,000 miles a year, £3,745 deposit, 6.3% APR). Spec the same drivetrain in a seven-seat SE L version and you’ll pay £425 a month on the same terms – so it’s up to you whether the additional styling is worth £25/£35 extra. Bare in mind the most basic seven seat model (SE 1.4 TSI) is just £268.30 a month – there are certainly cheaper ways to get into a family-sized Kodiaq. Both trims ostensibly get you a bodykit, bigger wheels and fancier seats – while the overall driving experience is no different to a cheaper Kodiaq. For my money the Scout is a much more interesting thing to look at thanks to its additional chrome-a-like bumper extensions, plus it offers greater ability thanks to its off-road mode and hill descent control. Ultimately the choice comes down to whether you want additional Sport or Utility in your SUV. Sorry to be annoying. 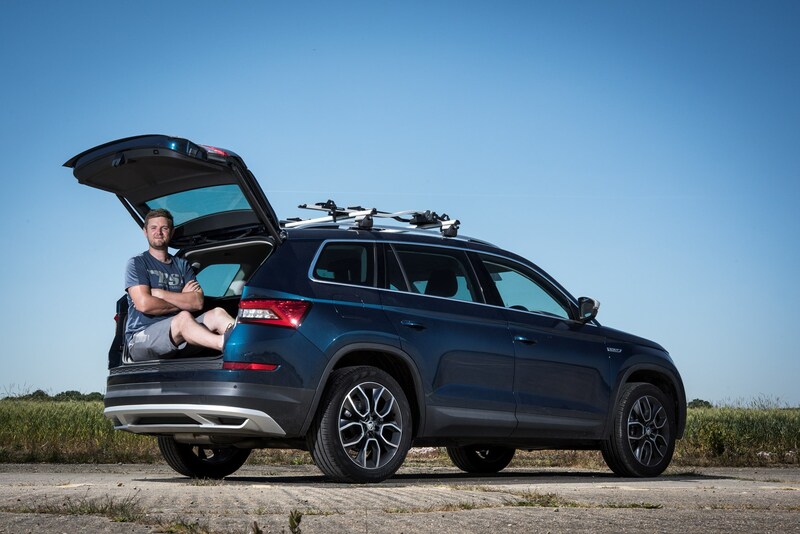 While a bike could fit comfortably in the Kodiaq’s 2,005-litre boot, if you plan to transport one with any sort of regularity, it’s well worth investing in a proper cycle carrier. Wedging your bike into the back of the car invariably ends up with bits of trim getting scratched by errant pedals and mud from the tyres being ground into the carpets and sometimes the roof liner. There are a number of different types to choose between – from vacuum mounts to frames that you can ratchet-strap around the bootlid, plus the more popular roof- or towbar-mounted systems. For that reason, the Parkers team picked three long termers with different cycle-carrying accessories to see which we rated. Read on to see why the Kodiaq is the best, or to read the (wrong) conclusions of my colleagues follow this link. Which system have you got? The towbar variety is the easiest to use but makes parking difficult and blocks the boot lid from opening and closing. Also my Kodiaq doesn’t have a towbar so that option is out. Vacuum clamps are too expensive and having previously owned one of the frames that attaches to your bootlid, and scratching my car beyond all recognition with it, I decided a roof-mounted option was best. 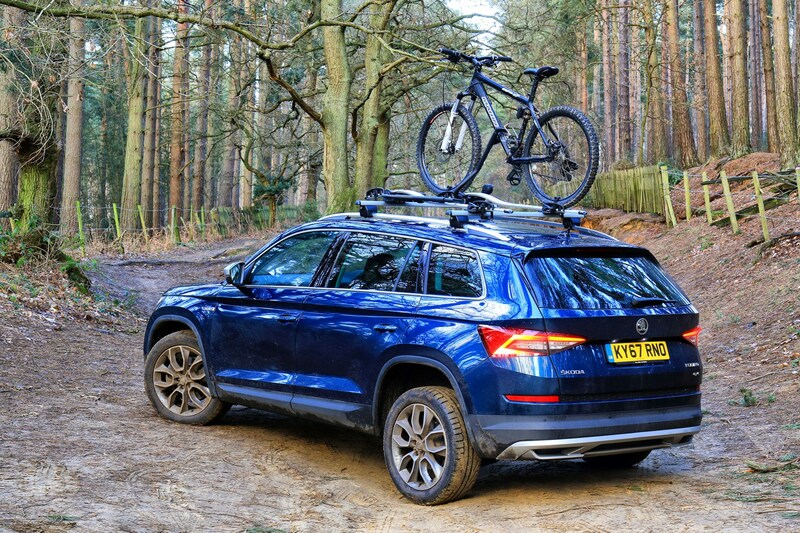 A pair of Skoda-approved roofbars will cost you about £200 and then you’ll need a couple of Thule bike carriers at about £90 a go too. Err…can I buy cheaper ones? There are plenty of third party options available offering better value for money, but if you tell the sales person in the Skoda garage that you need roof storage when you’re buying your Kodiaq, this is the system you’ll get. Without being a roof bar bore I’ve sampled two other types on previous Parkers long termers – an excellent (but pricey) Audi setup and a less good but reliable VW outfit. 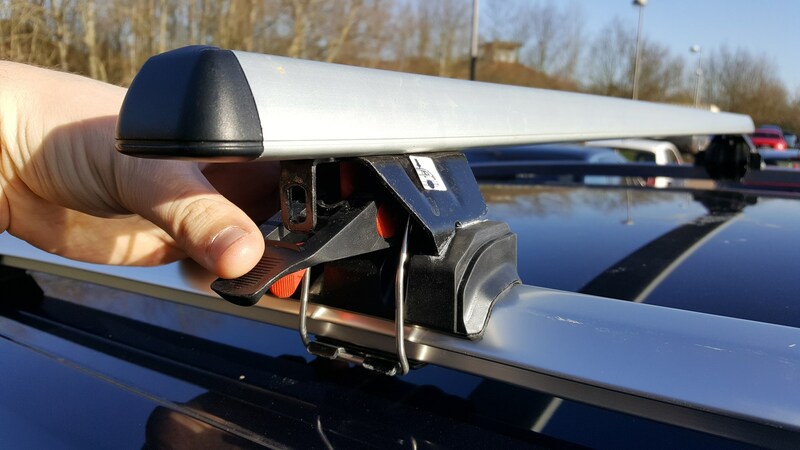 I liked the Audi bars because they fitted into a designated section of the roof rail, while the VW ones could be clamped at any point and therefore required the use of a tape measure to locate properly. These Skoda bars are the cleverest though because unlike the Audi pair, which requires the use of a special (and easily lost) wrench, they just clamp onto the roof rails with a clever lever system. They only fit in one place too so once you’ve locked the bike carriers onto the bars, the whole unit comes off and goes on in one go. If you lazily leave the bike carriers on your roof, it’ll cost you about 3-4mpg and they whistle a bit on the move, although nowhere near as much as other cars I’ve driven. Like our Mazda CX-5 long termer. The big elephant in the room though is how hard it is to get your bike onto the roof of a quite-tall SUV, as ably demonstrated here by my financially savvy but vertically efficient colleague here. I’ve never had a problem getting bikes onto car roofs (being of sufficient height) but understandably this could be an issue, especially if your bike is heavy. 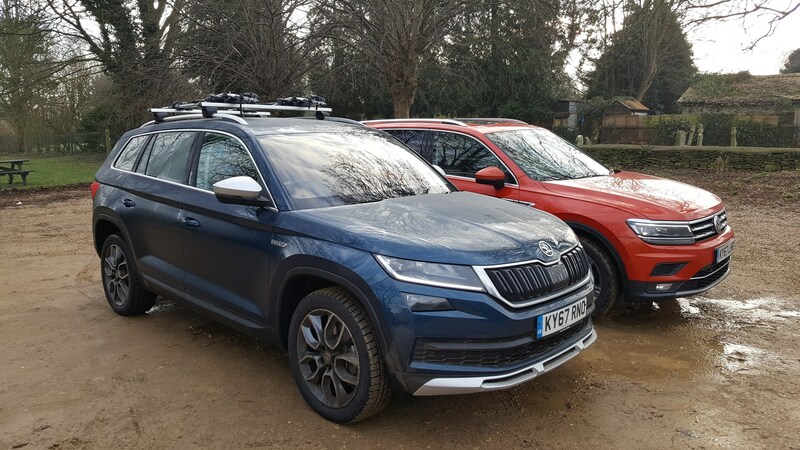 As with all Parkers long termer group tests, the Kodiaq really shines here – the roofbars fit with ease and do very little to make themselves a nuisance in terms of noise or extra fuel costs when attached. In the end, we crowned Tom’s Countryman the victor, primarily because the (expensive) tow-bar carrier MINI supplied was excellent. Not only was it lower than a roof system but it tipped out of the way to allow boot access, and tucked away into a special drawer in the car when not in use. 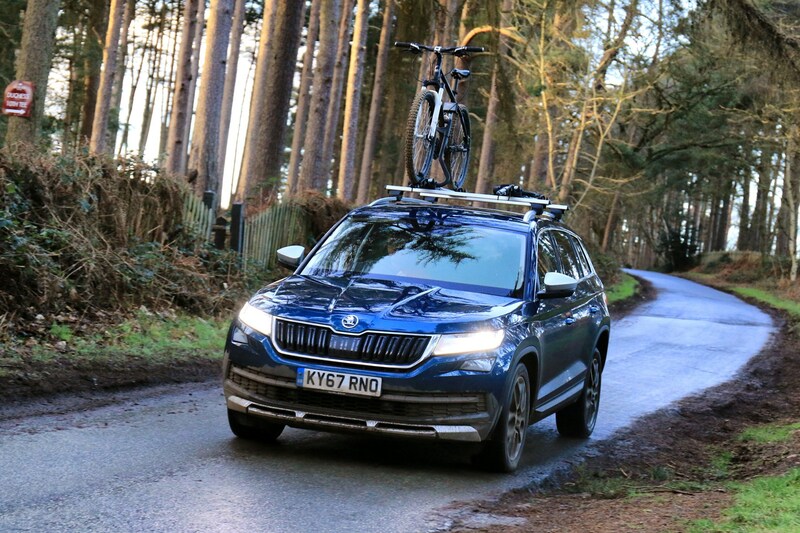 For all other intents and purposes, though, the Kodiaq is a fantastic cycle support vehicle, a role it enjoys frequently now the weather is improving. Limited engine choice in the Kodiaq but a broad range of talents - so which is best? It’s time to talk engines – specifically whether you should pick petrol or diesel power for your Skoda Kodiaq. We chose the 190hp diesel because it boasts the second fastest 0-62mph time and second best fuel economy. That makes the 2.0-litre TDI 190 the best all-rounder - you can have a more efficient but slower car, or a faster but thirstier one. Trouble is, our car is also the most expensive. So a cheaper petrol engine will cost less overall? Depending on your circumstances – possibly. We’ve driven the cheapest 1.4-litre TSI petrol engine (shown here in SportLine trim) which costs £4,315 less to buy, although bear in mind that's for a manual not an auto like our car. Translate that into PCP finance and you’ll save about £60 per month by picking a 1.4-litre Scout, on a 48-month, 10,000-mile-per-year contract with a £3,710 deposit and 6.3% APR. Company car driver? You’ll be looking at monthly BIK tax bills of £118 instead of £129, which even with my poor maths, is a smaller number. That works out as an extra 400 miles of fuel based on the claimed fuel economy, so petrol power is a serious consideration for a lower-mileage driver. If you want to purchase the car at the end of the finance deal you’ll also have a lower optional final payment to stump up for the petrol. Can you achieve the claimed economy? Yes. We drove the petrol version reasonably carefully on motorways to an event in North Wales and saw 41.4mpg on the car’s trip computer. The key to this frugality is the fact that the 1.4-litre Kodiaq doesn’t have a huge amount of power, so there’s no benefit to driving it like a sports car. In addition, it’s a world apart from our vocal diesel engine, both in terms of noise and vibration – especially on startup. Giving it the beans and shattering that peace just doesn’t feel like the right thing to do. So it’s really slow then? It’s perfectly adequate for family use, where you’re unlikely to have many chances to floor the throttle anyway. I actually find our 2.0-litre diesel Kodiaq a bit over the top when I’ve got my family with me, only ever using about half of the throttle's maximum reach. 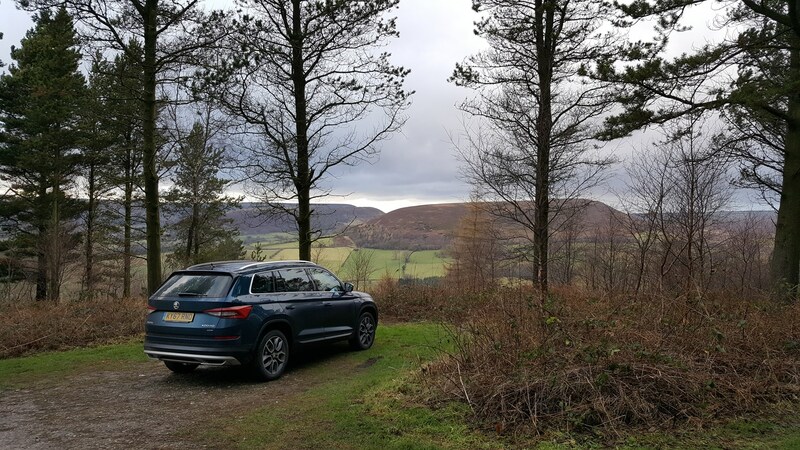 I started to miss the extra torque of our 2.0-litre diesel on the mountain roads of North Wales however, where the smaller displacement motor started to feel decidedly strained. But that's quite a niche requirement (unless you live in Snowdonia). If you don’t do a huge monthly mileage and aren’t interested in out-and-out performance, then the 1.4-litre petrol Kodiaq is a cheaper and more refined choice. I like the extra power of our Kodiaq when I'm driving alone but I reckon I could live without it in exchange for an extra £60 a month. That quite a bit of go-karting. Is our Kodiaq SUV desriable enough to change Leise's mind about the badge? Of all the long-termers I’ve run during my time at Parkers, few have prompted conversations with strangers like the Skoda Kodiaq Scout. Everyone wants to know whether it’s any good or not, whether I’m stood at the diesel pump or taking my son to a birthday party – which is most weekends, because like all toddlers, he has a more interesting and varied social life than his parents. Anyway, this car’s mission statement (in the UK at least), is to convert drivers whose opinion of the Czech maker is still stuck in the 1990s, before the famous ‘It’s a Skoda, Honest’ repositioning campaign. 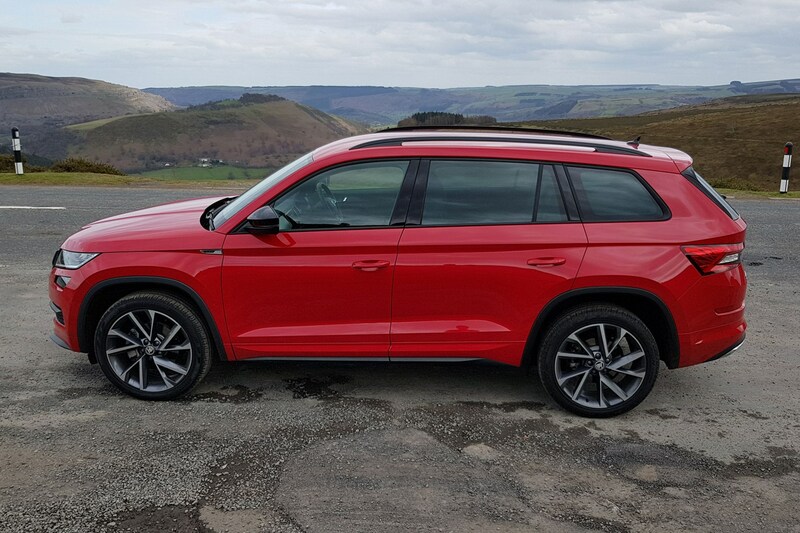 All the odds are in its favour – it’s a desirable SUV shape, the interior is a step up in terms of quality, and it’s got all the usual Skoda practicality baked-in. Like a better value Volvo XC60 or Land Rover Discovery Sport. 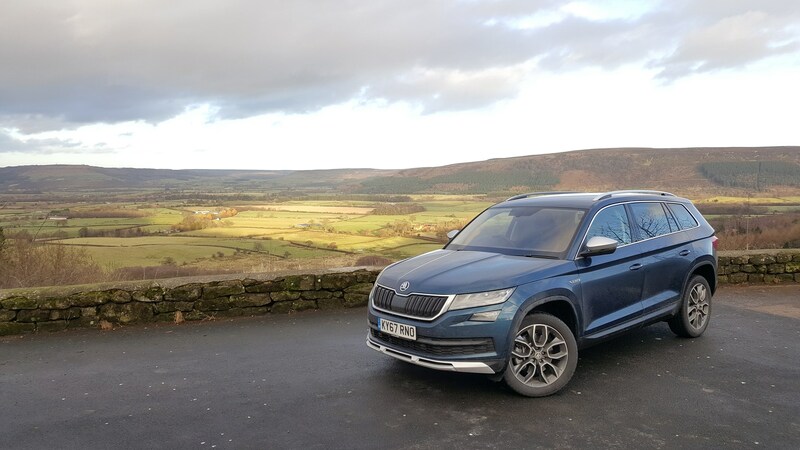 When I was given the opportunity to drive the Kodiaq I was a bit hesitant – when I was younger, Skoda was not a cool badge and you were laughed at if you owned one. Now it’s a different story and I do not want to give the keys back, because this car has everything that I need to get around, and is actually pretty cool. It’s is full of space which makes my life a breeze when I’m filling the boot with bags of weekly shopping, football kits or brimming it for a car boot sale. The (optional) heated steering wheel and seats are a godsend when you’ve been standing on the side of a football pitch for two hours in minus 2 degrees. Being 4”11 I like to get up high in the car so I can feel comfortable and in control. 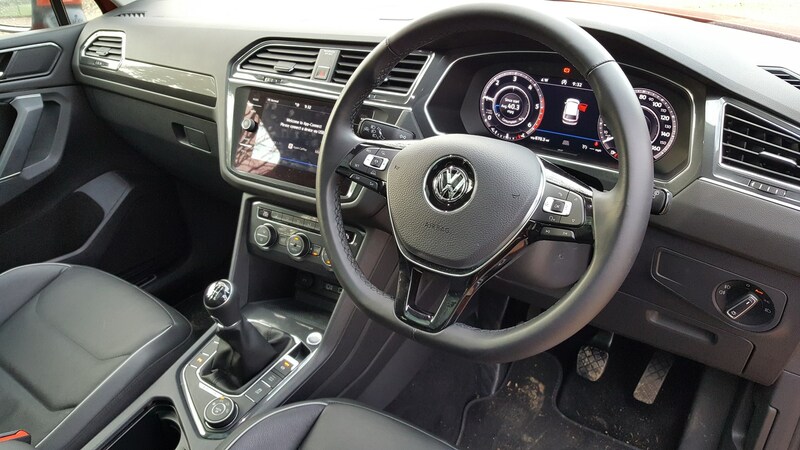 The steering wheel and electric seats offer loads of adjustment so I feel safe and in the right position I need to be in. All the controls are easy to use and once set up my phone connects via Bluetooth automatically, straight to my iTunes, so I don’t have to put up with some daft channel the previous driver (Adam) has listened to. The back row of seats are very easy to put up and down making it into a seven seater if needed, very quickly. The second row moves backwards and forwards very easily with the slide of a lever underneath the seats. The ride quality on this car is excellent - it irons out the bumps in the road making every journey smooth. This car gives me great sense of security when driving, it’s quick to pull off and overtake giving me even more confidence when driving. If I had to pick some negatives it would be petty things like the wood interior or the paint colour - I prefer black or silver - but those are easily changed. While this Kodiaq has reversing sensors, a camera would make parking much more accurate, which I think is needed with a car of this size. Overall though I love it – the perfect family car. It gets ten out of ten from me. Mission accomplished I reckon. Now I need to work out how to get the keys back off Leise. The Skoda Kodiaq Scout comes well-equipped from the off but there are plenty of things to add to it if you’ve got the cash and inclination. We actually configured this car and stuck to a budget of £40,000, because that meant we’d be selective in what we chose (like a real person), rather than just ticking every box. Some things were picked because we liked them, others because we wanted to see how worthwhile they seemed after six months – which we’ll now explain. Thing is, even if you go mad with the configurator, you’ll struggle to break £50,000 on a Kodiaq. So after we explain our choices, we’ll have a look at what else we’d recommend adding to your car. Petrol blue metallic paint (£595): The only free colours for the Kodiaq Scout are a flat blue, white or grey, and we reckon a metallic hue dramatically enhances the look of the car. We picked Petrol Blue because the vastly more desirable Emerald Green wasn’t available at the time. Boo. Verdict: Worth it. Children’s Pack (£200): This contains roller blinds for the second row and a button to remotely activate the child safety locks. The former is great for inducing toddler naptime but slightly limited in use because they’re awkward to extend from the front seats while on the move. They also make great makeshift percussion instruments for a three-year-old tantruming about not being allowed another Wine Gum. The safety lock button is a godsend, and not just for falsely imprisoning your colleagues on a lunch-run, but for those moments when the aforementioned toddler moves on from pinging the roller blinds to attempting to open the door on the M25. Verdict: Don’t leave home without it. 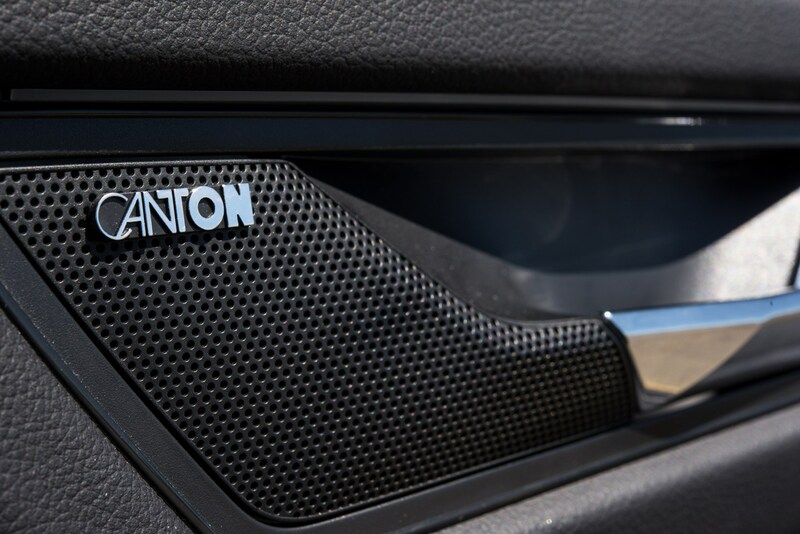 Canton sound system (£400): The standard Kodiaq sound system is pretty decent as it goes but this option gives you a much louder 550w set up, with better dynamic range thanks to a subwoofer in the boot responsible for reproducing earth-shakingly low bass. It’s not as good as a high-end branded stereo in an Audi or Volvo but it’s also nowhere near as expensive. Verdict: PARDON? Oh, sorry, worth it. Space saver spare wheel (£100): Required for the above because it houses the subwoofer underneath the boot floor, but very handy to have anyway. That is unless you like explaining to your child that you missed their karate grading because you were sat on the hard shoulder with an unrepairable puncture and a useless can of tyre foam. Verdict: Worth it. Dynamic Chassis Control (£980): Tricky one, this. 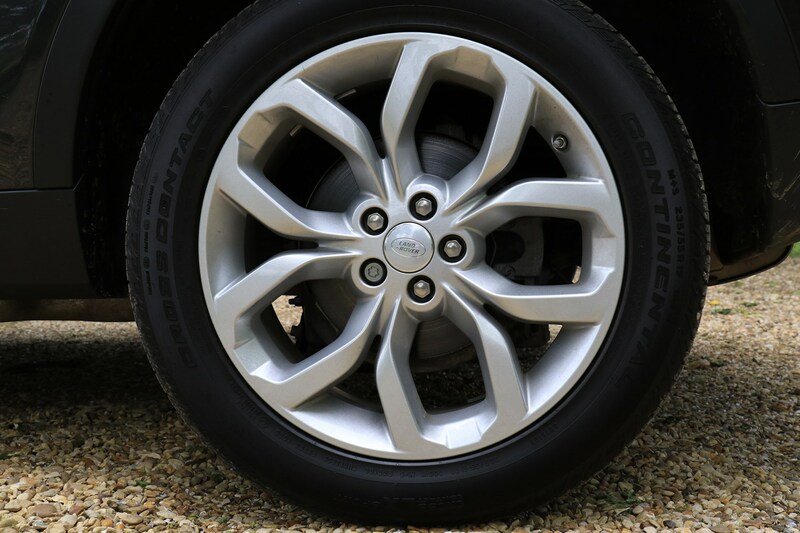 We hypothesised it would be an essential selection to take the edge off those standard 19-inch alloys, but after nearly six months we’re not so sure. 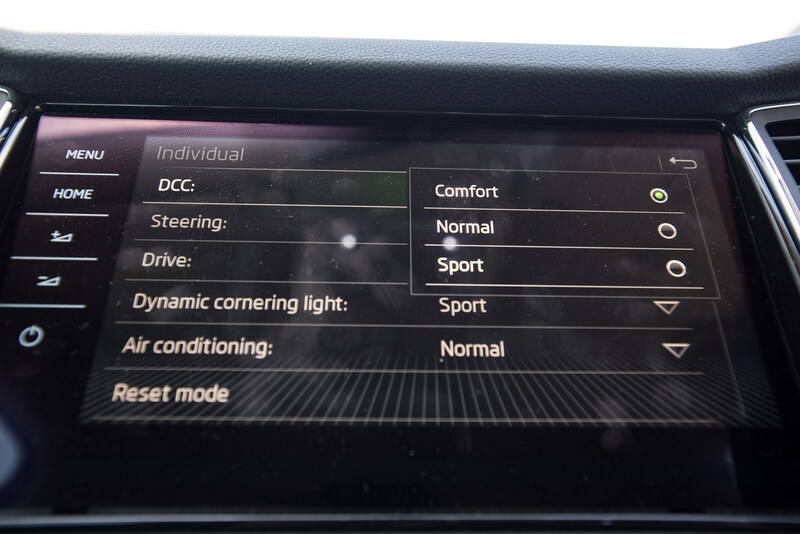 This option unlocks two additional suspension modes in the drive mode selector menu – a firmer Sport setting and Comfort, which is floaty in the extreme, especially at low speeds. It’s nice on the motorway but around town the softer setting induces hilarious levels of brake dive and often means the body needs two or three bounces to recover from a speed bump, in an ironically unComfortable fashion. Verdict: Not essential. Heated windscreen and washer nozzles (£335) and heated front and rear seats (£200): I picked this as part of my wintertime desire to heat all the things, because there’s nothing more smug-smile inducing than watching your neighbour scrape ice off their car from the comfort of your heated driver’s seat, as your car gently melts the winter woes away like the warm embrace of a loved one. Especially satisfying if you’ve leant them the ice scraper tucked away inside the Kodiaq’s fuel filler cap because they were using an old debit card. Verdict: Worth it. For three months of the year. 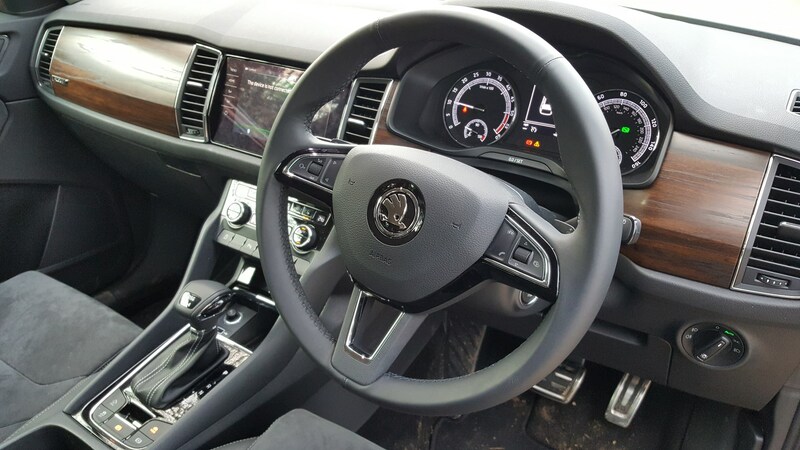 Heated three spoke leather multifunction steering wheel with DSG paddles (£150): A heated steering wheel is just about the most indulgent thing you can spec on a Kodiaq and ties in nicely with the above, but the real reason I ticked this box was for the gearshift paddles. The automatic gearbox on this car is great but it loves to shift up at inopportune moments to save fuel, which can be very frustrating when you’re trying to enjoy a nice road. That said, I appreciate not everyone (hardly anyone), will care about that, so while I think this option is a no-brainer, here’s a more rational verdict: not essential. Skoda Roof Box (£380) plus bars (£190): Roof boxes are cool, and this 380-litre job is Skoda badged for additional brand swagger. Verdict: Fill it with skis. Or stuff for the tip. 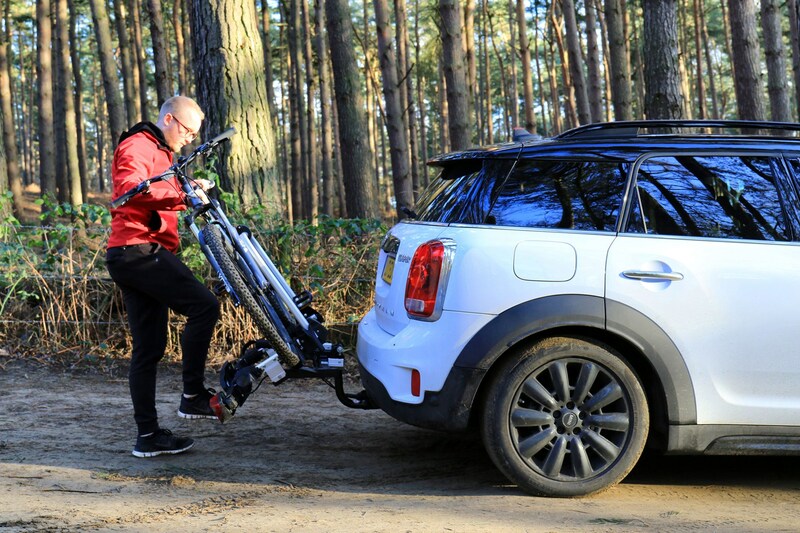 Electrically folding tow bar (£860): Great for hauling things along or simply hooking up to a back-saving tow-bar mounted bike rack. Plus it folds away when not in use so you don’t look like a towing dork. Verdict: Tow infinity, and beyond. Virtual pedal (£185): First you had powered bootlids, then powered bootlids that you could open remotely with the key, now there’s a powered bootlid you can open by waving your foot under the car. Ideal for when you’re carrying lots of shopping bags, one of which containing substantially more bags of crisps than the list your wife gave you permitted, that you need to stash quickly in the boot. Verdict: Luxurious and indulgent – like those artisanal tortilla chips. 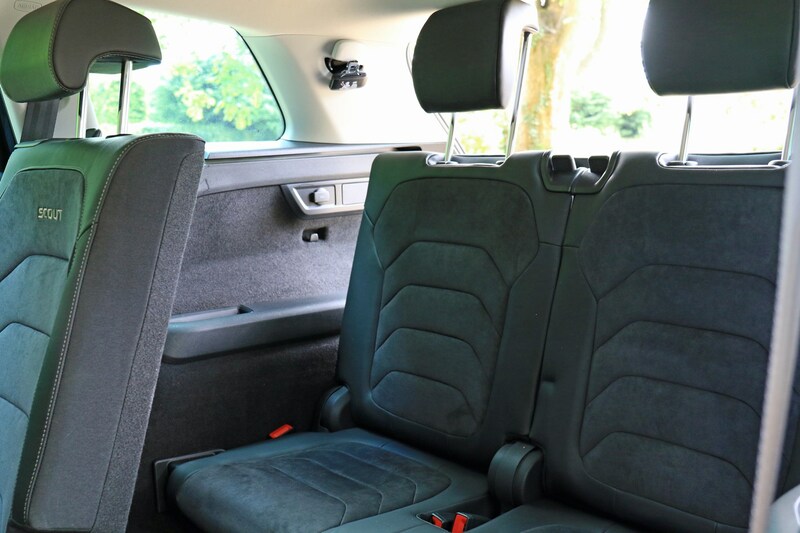 Remote folding of rear seats (£95): Picture the scene – you’re struggling to get a boxed Ikea Kallax shelving unit into the car when you realise the second row of seats needs to be collapsed. Do you put the box down, walk around the car and manually drop them? No, you pull a lever in the boot and they tumble effortlessly away. You’re a legend. Everyone in the car park is now clapping. Verdict: Win at Ikea. Mythos gloss black decorative insert (£130): Want a Kodiaq Scout without the wood trim? You’re mad – but Skoda has you covered. Verdict: Go against the grain. 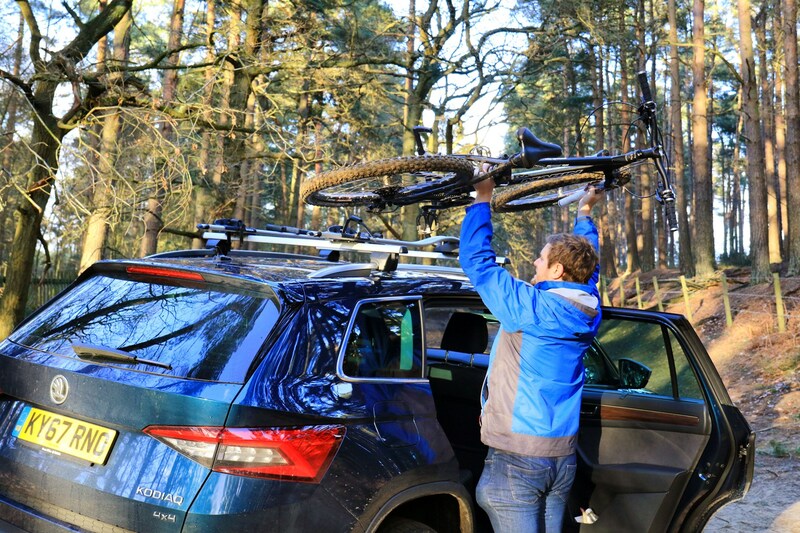 Panoramic sunroof (£1,165): Let the sunshine in – also useful for checking your bike didn’t fall off when you drove under the car park’s height restrictor. Verdict: Let there be light. It's the ultimate leftfield seven-seat SUV showdown - but which is best? 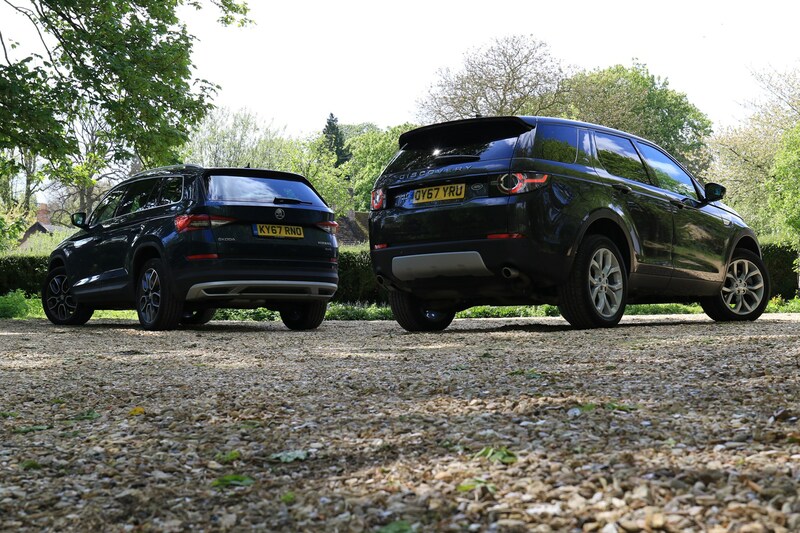 On the face of it, mine and Keith’s long termers are very similar – both are seven-seat SUVs with style and value for money at the forefront. The French and Czech manufacturers approach this brief from entirely different angles though, and for that reason we’ve spent many an afternoon arguing whose is best. Trouble is, we both like our respective cars very much, which can make it hard to be properly objective. Time to unpack the very neutral Parkers Head of Group Tests Tom Goodlad to help us arrive at a decision once-and-for-all. 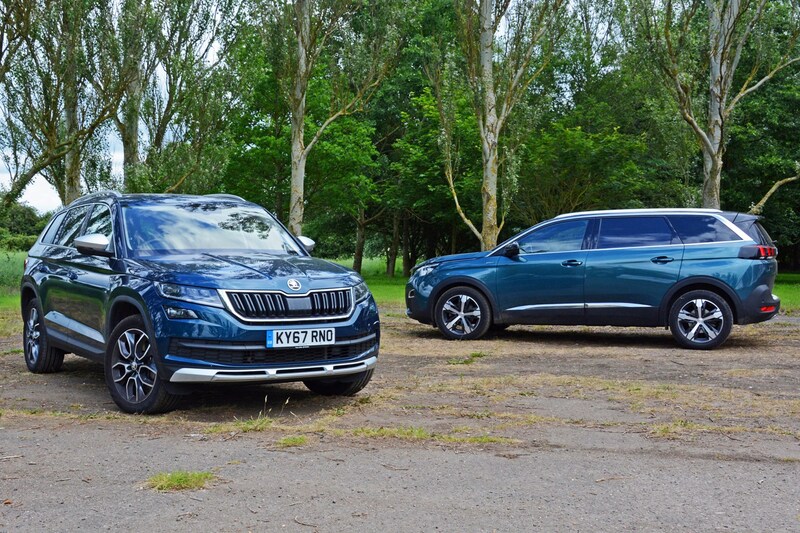 For a start it’s worth pointing out my car has by far and away the better drivetrain – the Kodiaq is powered by a 190hp turbodiesel with four-wheel drive and DSG dual-clutch gearbox, while Keith's makes do with 131hp from a three-cylinder petrol, with front-wheel drive and a manual ‘box. In fairness I really like Peugeot’s characterful petrol engine, or at least, I really like it in a small hatchback like a 208 or 308. In Keith’s car it needs thrashing to within an inch of its life to make decent progress and this gets boring quite quickly. Like the Skoda you can get a 2.0-litre diesel with 150- or 180hp in the Peugeot. And you should do that, I reckon. Which car has more kit? Annoyingly, Keith’s car comes with more things as standard, including handy tables for the rear-seat passengers and removable chairs in the third row. 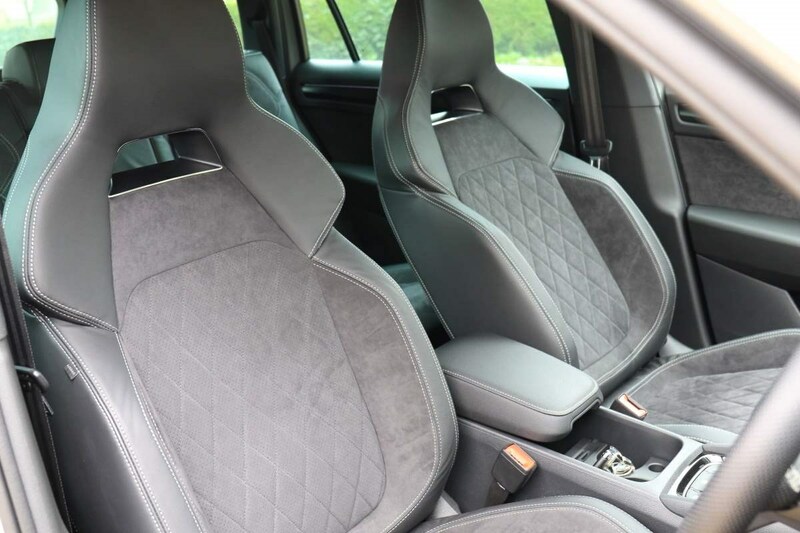 The interiors are hard to pick apart too – the Peugeot’s is more interesting to look at but the Skoda uses nicer materials and is better built. Ergonomics are still a weak spot for the 5008 too, although this car is better than our button-bereft long-term 308 GTI. The Kodiaq beats both of those, though, because it’s so much easier to use. Hard to define really because Peugeot’s bootspace figures are measured to the roofline, unlike the Skoda’s. In terms of outright space the 5008 wins – 2,150 litres vs the Czech car’s 2,065 – but only if you remove the French car’s rearmost seats. My car is roomier in the very back too, so that’s worth considering if you want to transport anyone larger than a teenager with any regularity, as you can see from Tom's discomfort in the Peugeot below. For day-to-day purposes, the Skoda is better, unless you need the Peugeot’s three separate middle row chairs (the Kodiaq is split 60:40). Which is better to drive? 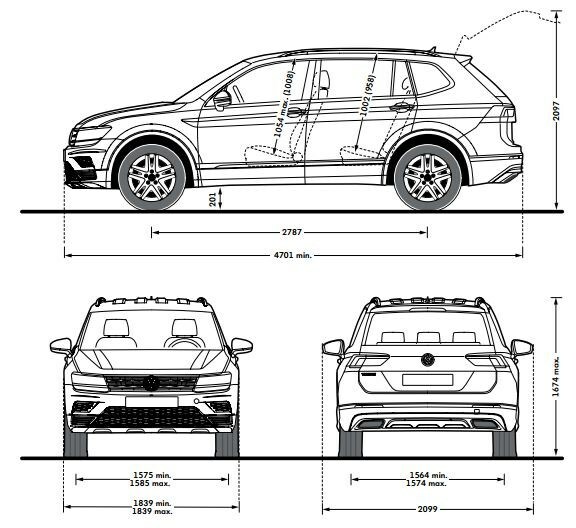 Kodiaq. 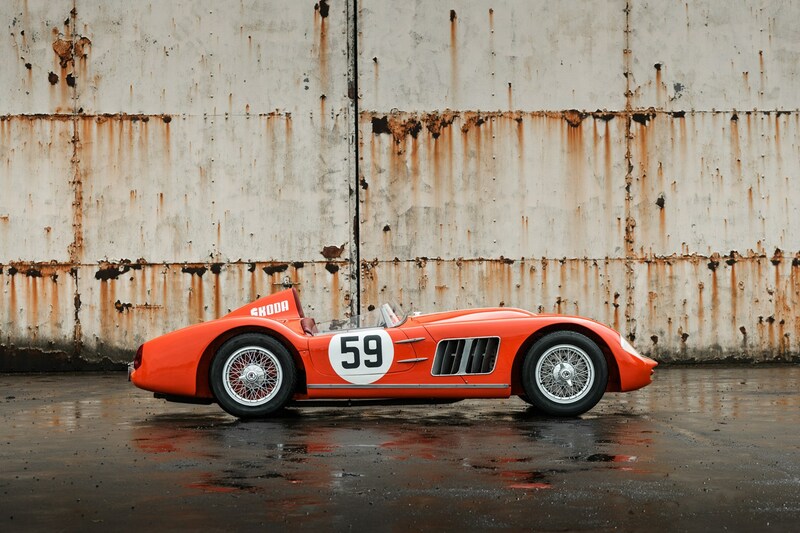 And for that reason (plus the others discussed above), it’s the car I’d recommend to people nine times out of ten. 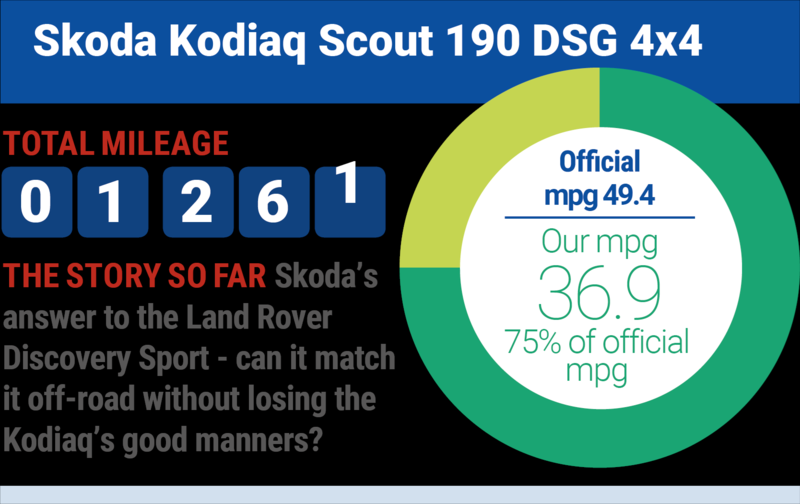 How much diesel does our Kodiaq use compared to what Skoda says it should? Short update this week where we talk about fuel economy, as it’s coming to the end of our time with the Skoda Kodiaq Scout. We calculate our MPG figures at Parkers using maths rather than the onboard computer, as the latter can quite often be inaccurate. Skoda promises 49.6mpg from this car so we’d be happy with anything within 10% or so of that figure, given how it’s often driven fully-loaded or with bikes on the roof. What economy have we got? During our six months and some 9,000 miles of ownership we’ve averaged 41.3mpg, or some 83% of what the manufacturer claims is possible, which is jolly good. Other than a 30mpg tank when the car was barely run in, the fuel economy under normal running conditions barely dropped below 35mpg and was often north of 40mpg, especially when we took the car on a long motorway run. Fitting the roof bars and bike rack would result in a drop to about 32mpg, but in all other cases the Kodiaq’s fuel economy was rock solid. 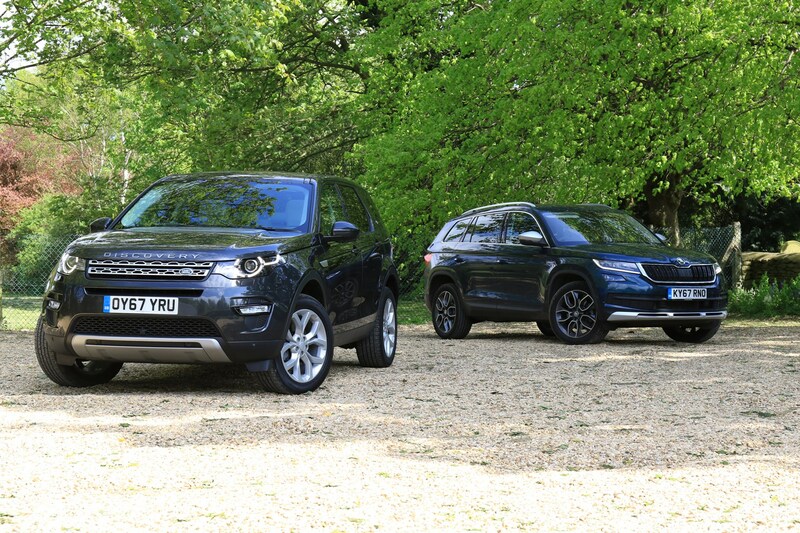 How does the Kodiaq hold up against its ultimate rival - the more premium Land Rover Discovery Sport? Any large SUV with off-road pretentions is sooner or later going to have to get measured alongside something with a Land Rover badge on it – the British manufacturer has been carting parties of seven across muddy fields for decades, after all. For roughly the same money as our Kodiaq Scout you can get a Discovery Sport with a similar diesel engine and standard kit list. One offers badge appeal and stronger off-road ability, the other greater practicality and value for money. But which should you buy? Let’s get this out of the way early on - our Kodiaq costs £37,425, while the Discovery Sport is £41,600. Translated into monthly PCP costs, you can expect to pay £428 for our car and £466 for the Disco, the latter hampered by a higher list price, interest rate and optional final payment. 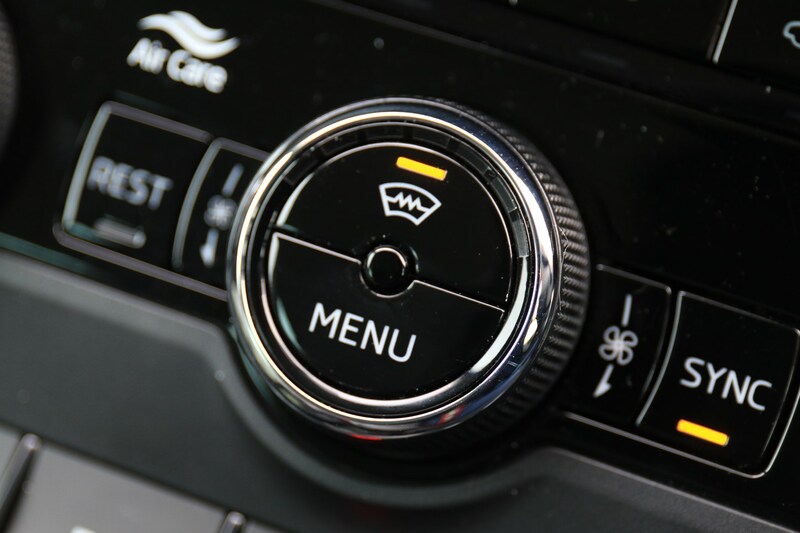 HSE spec is a sort of middle-to-top trim so you get 19-inch wheel and lots of standard tech – some of which is missing from our Kodiaq, such as leather upholstery, a reversing camera and uprated stereo. 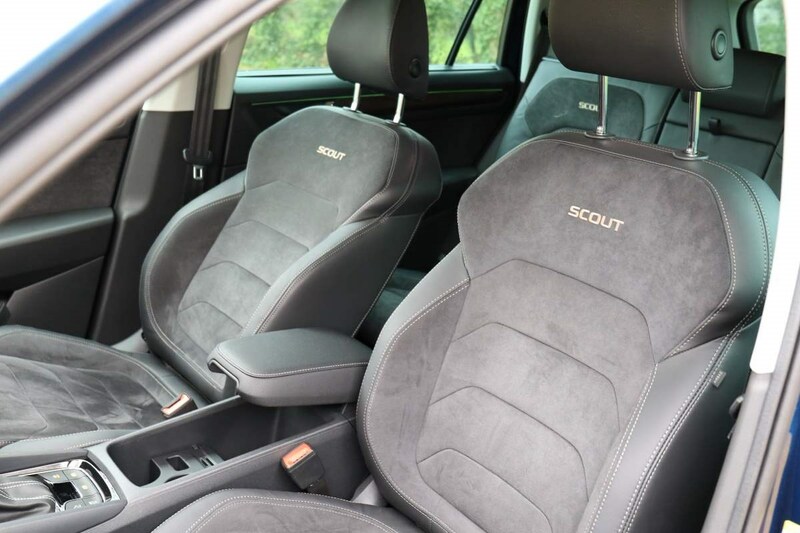 That said, if you’re not bothered about leather you can spec those things in a Kodiaq Scout for peanuts and equalise things in the equipment stakes. Plus, our car has LED headlights as standard, compared with the Disco’s Xenons. The Kodiaq has more power, while the Disco has more torque and as a result feels smoother while accelerating. The Skoda is quite boosty with a strong, urgent midrange. It’s quite a bit quicker from 0-62mph too, and in theory uses less fuel. Our car is a bit clattery on start-up while the Land Rover is quieter, but they’re both noisy when pushed to high revs. The automatic gearboxes in both cars can be a bit ponderous in their native ‘D’ modes. 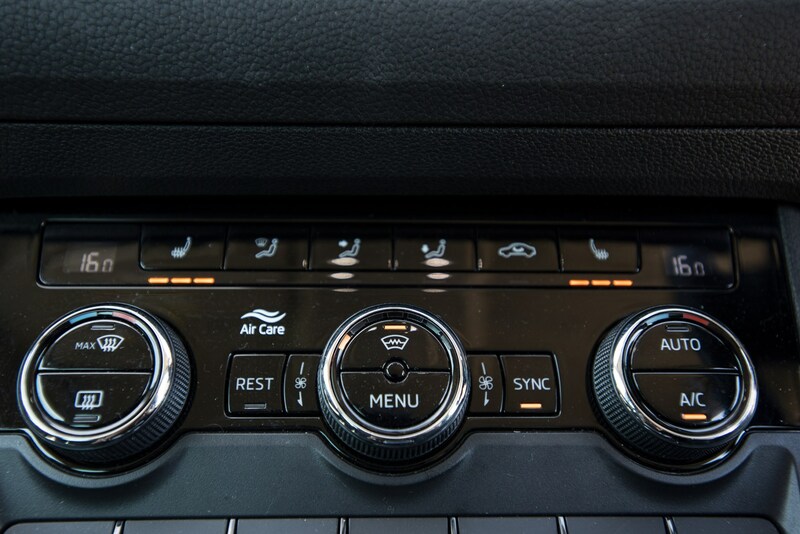 The Disco’s ‘S’ setting is much sharper than the Kodiaq’s, but our Skoda reacts better to the wheel-mounted paddles, particularly when you go for a double downshift. 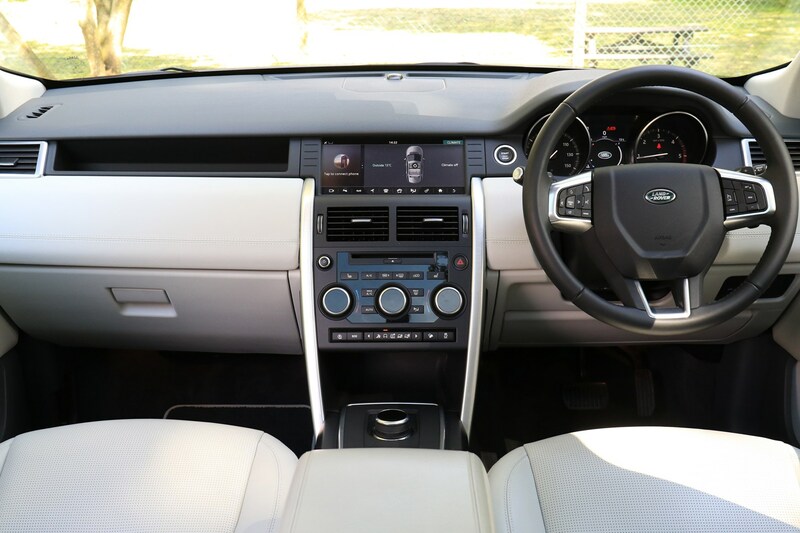 The paddles themselves are larger in the Landy but made of a flimsier plastic. In terms of handling, neither of these cars feels sporty but the Disco has better steering and body control. 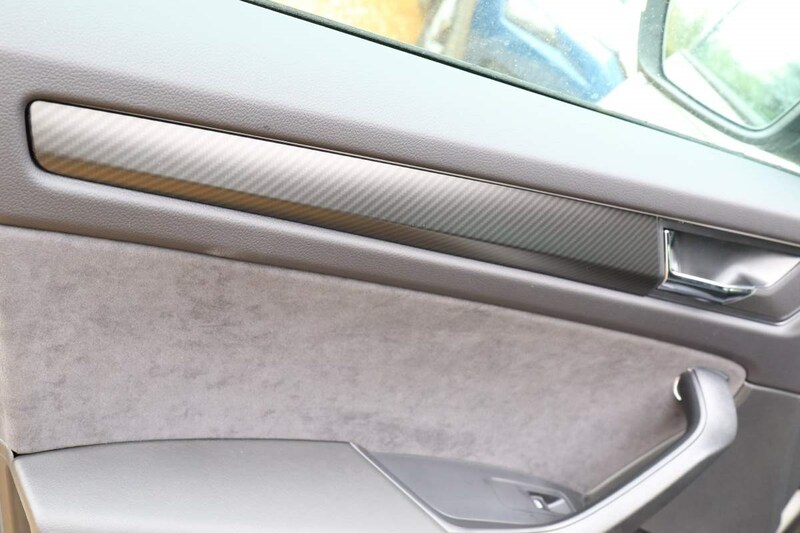 Performance handling isn’t always a high priority in a large family car like this but bodyroll can make your passengers feel sick, so it’s a worthwhile consideration. In terms of outright ride the Disco is better at low speed but the Kodiaq is better on the motorway. Parts of the Disco feel more upmarket – the doors close with a proper thump, the rotary gear selector is nicer than the Kodiaq’s and the leather upholstery brightens the cabin up significantly. 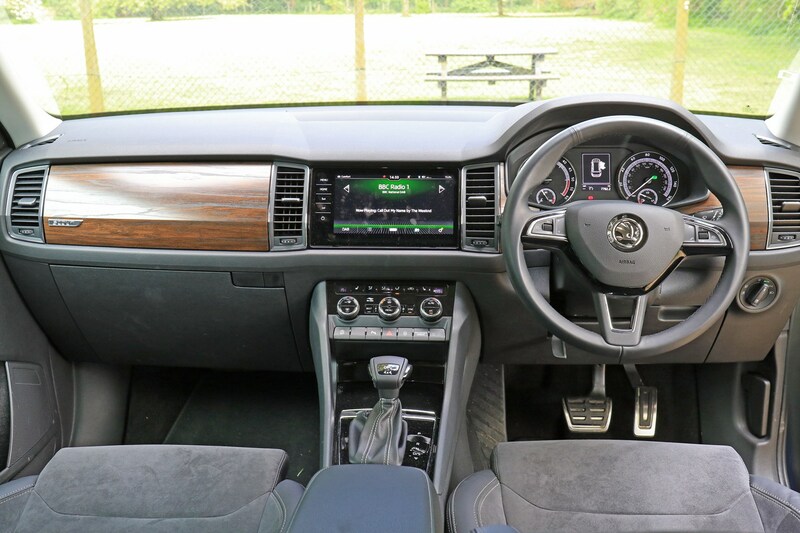 That said, some of the trim feels a bit naff and doesn't fit together as well as the watertight Skoda, plus the VW Group multimedia screen is bigger, better to look at and more responsive. Visibility out is better in the Kodiaq thanks to some large blindspots in the Land Rover, and while the latter comes with a reversing camera, it’s offset to one side, which takes a bit of getting used to. Also, our car has an autohold handbrake – a small thing, but one that becomes incredibly useful in traffic. Our car has more bootspace with all seven seats up but the Disco is a marginally better five seater, while the Skoda is significantly larger inside with all the chairs down. The Kodiaq is about 100mm longer than the Land Rover overall which might make it slightly harder to park, if you pick a gap with small tolerances. Side-by-side they look quite similar but in isolation I reckon the Disco hides its size better, looking more compact than the vast Kodiaq. What about where it matters though? 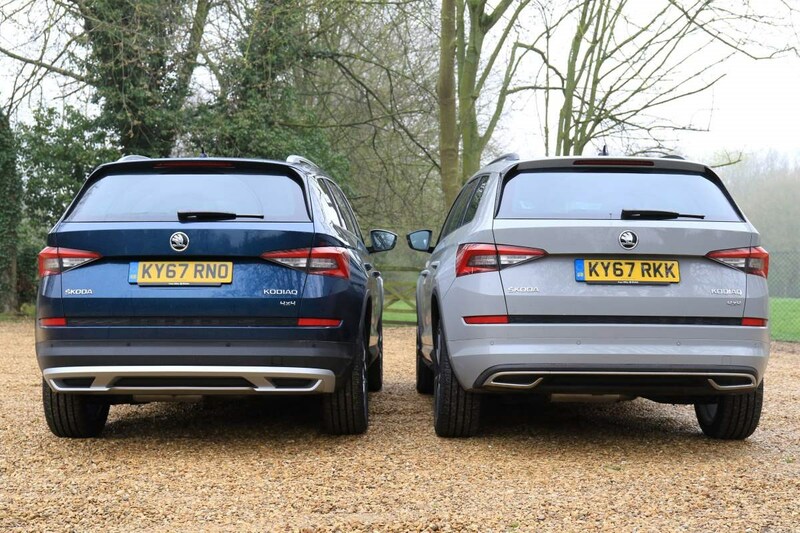 Well, for the vital third row test I had to call upon the Parkers Third Row Measurement Tool© (Finance Editor, Chris Lloyd) who you may remember did some vital work assessing the Kodiaq vs Tiguan Allspace. 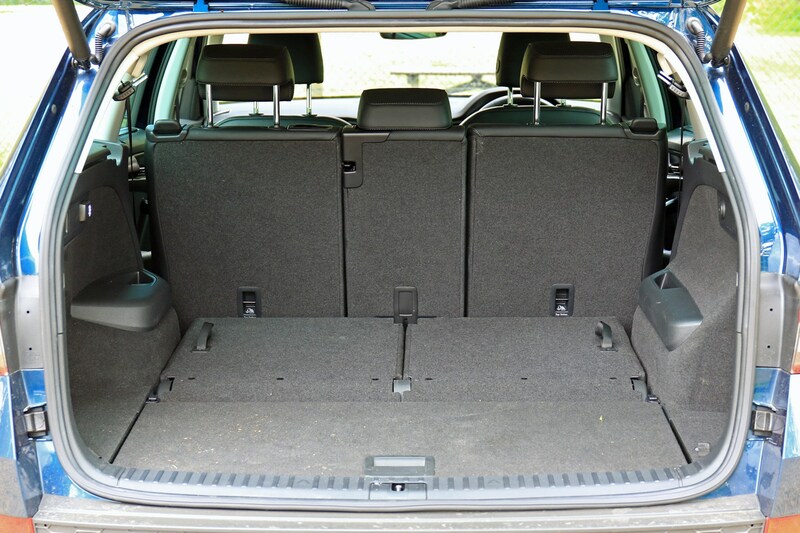 In short - the Skoda is better for a tip run and the more practical seven seater in terms of space in the third row and boot, while the Disco is better as a five seater if you only occasionally need chairs six and seven. Overall I reckon the Skoda Kodiaq Scout is a better bet. The Discovery Sport boasts more (optional) off-road tech and can wade into deeper water, but in reality the Czech car is good enough for most people - it certainly proved itself in the snow we had earlier this year – is cheaper to buy and run, faster to accelerate, and more practical. I’ve been putting this off for a while now but it’s time to say goodbye to one of the most complete all-round family cars I’ve ever run during my time at Parkers. 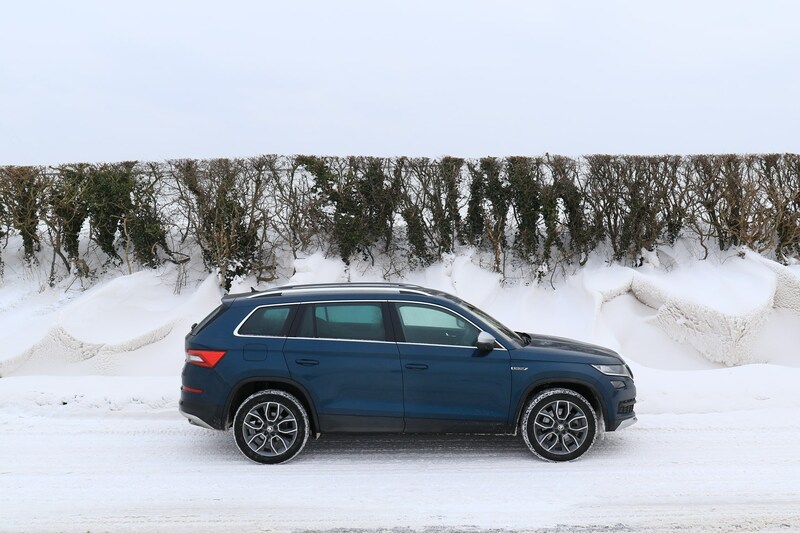 The Kodiaq Scout arrived during a flurry of snowy chaos at the end of 2017, equipped with go-anywhere winter tyres that enabled us to easily keep mobile even when the drifts stacked up radiator-high. The Skoda (literally) ploughed through the lot, even helping to rescue a stricken SEAT Ibiza driver, equipped with only a flip-flop to dig her front wheels clear. My policy of ticking every heated option came in very handy during the cold snap, making early morning starts a much cosier experience, although nothing will beat the VW Golf GTE’s pre-warmed cabin (when it was plugged in of course) in terms of outright ease in this respect. 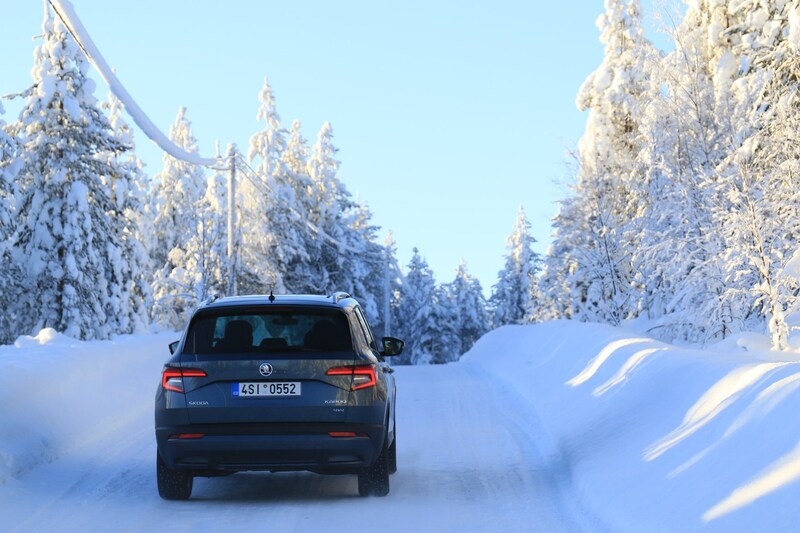 Then, with the aim of finding some trickier terrain to trip the Kodiaq up, we went to Finland to drive it off-road and on ice, even testing its clever all-wheel drive system to the limits by drifting it Ken Block-style (ish) around a frozen circuit. Not phased by that sub-zero baptism, we pitted the Kodiaq Scout against all its rivals, including in-house competition from the VW Tiguan Allspace, as well as quirky appeal from the Peugeot 5008, and the segment go-to car of choice, the Land Rover Discovery Sport. And it was better than all of them, frankly. Then we turned the competition in on itself and tried to work out whether there were better Kodiaq models we could have chosen. This was the only time a chink in the Scout’s armour could be found – there are better value models in the range, particularly if you do few miles and can get away with the petrol. That said, our car looked the best, and drove extremely well, so I reckoned it was worth the extra cash. 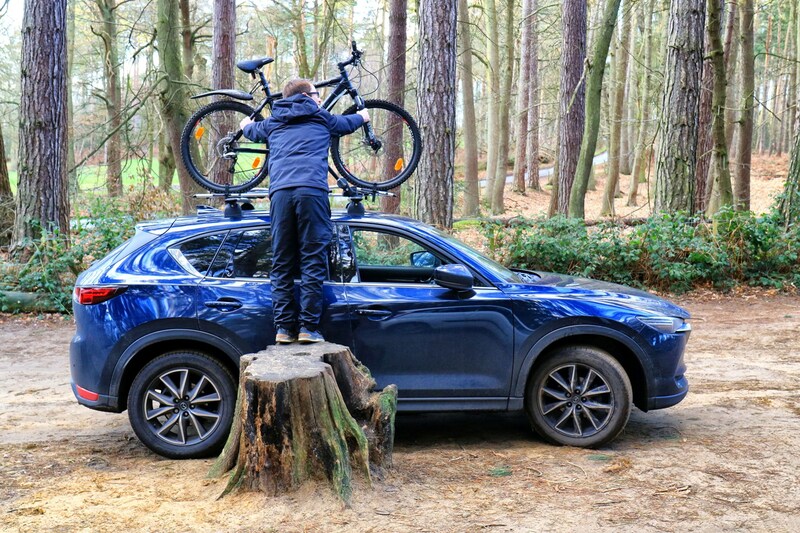 Finally we probed the Kodiaq’s practicality offering by making it tow a vintage race car and attaching bikes to its roof (most weekends), even testing how it coped with the latter compared with two other Parkers long-termers. 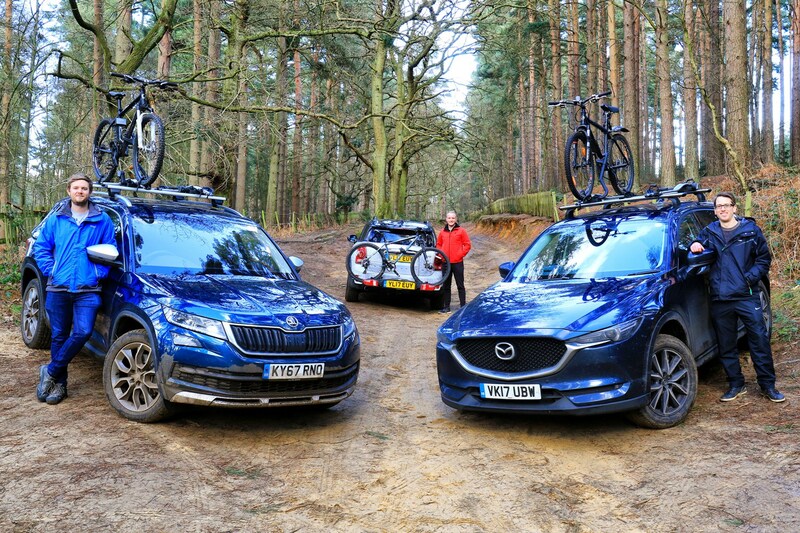 In short we gave the Kodiaq Scout a proper Parkers tear down over the six months it was on our fleet and found it to be the consummate family all-rounder. Comfy, serenely quiet on a run, and with the flexibility of two extra chairs for grandparents to occupy, the Scout did everything I asked of it on the weekend. Then, on my lonelier commute, it even brought a smile to my face on the twisty backroads of Peterborough. 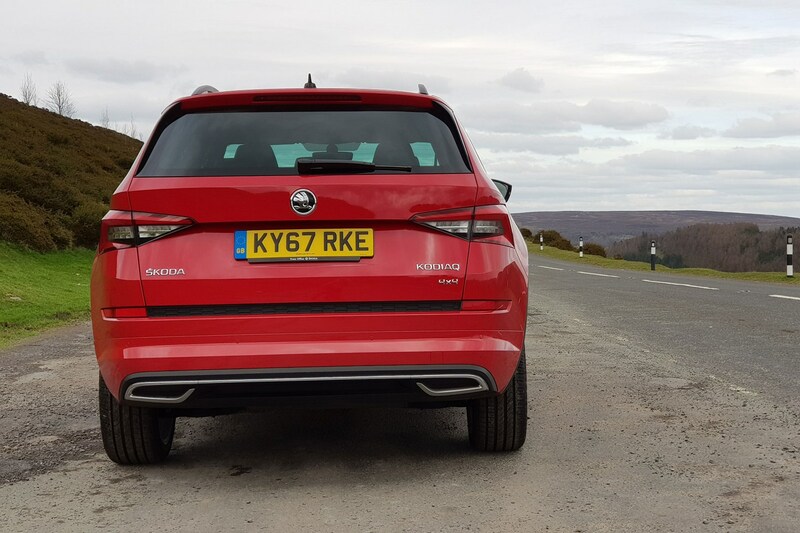 You wouldn’t necessarily expect it to be, but the Kodiaq is a genuinely fun thing to drive. What would I change? I’d like the three individual middle row seats my VW Touran (or a Skoda Karoq for that matter) had for added child seat placement flexibility. The suspension in comfort mode could be a bit boaty and the diesel engine was vocal on a cold start up. For all other intents and purposes though the Kodiaq was fantastic. Of all the long-termers I have run in the past, this Skoda was the one that prompted more conversations from most of my friends and even strangers at the petrol station. They all liked the look of the Kodiaq, some for the first time, and wanted to know if it was any good.